Costa Brava in Spain is well known for being one the first package holiday destinations. Now, 60 years later, this region is making a huge comeback. Having recently spent a week there with the kids, I can see why. National Geographic Traveler magazine included the Costa Brava in its list of the world’s twenty best tourist destinations for 2012. The secret is officially out. 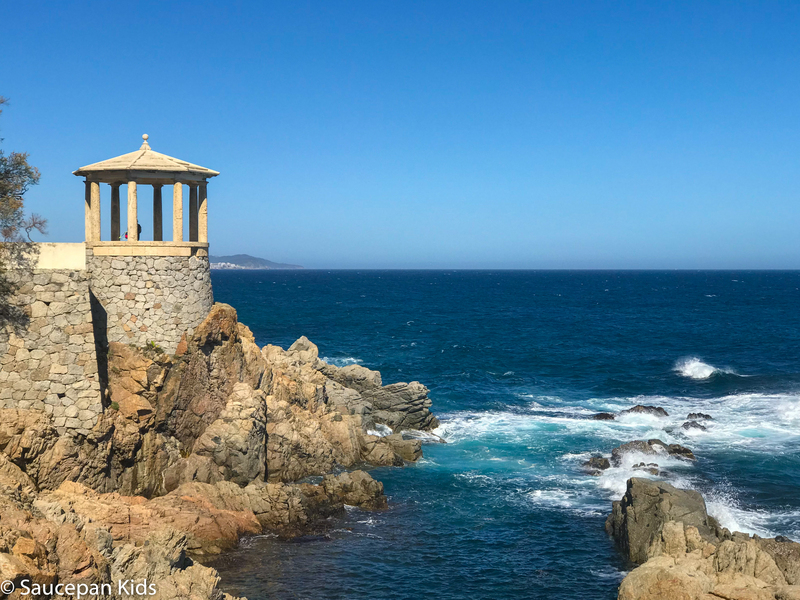 The Costa Brava is the coastal region in Catalonia north of Barcelona and stretches right up to the border with France where the dramatic Pyrenees mountains meet the Mediterranean Sea. 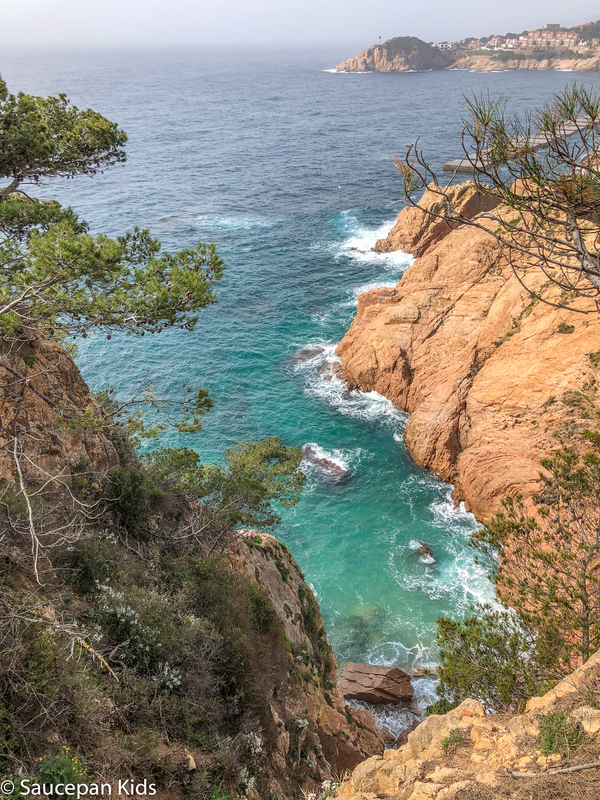 Costa Brava itself actually means ‘rugged coast’ and when you visit you won’t be surprised to see the dramatic cliffs, coastal walks and numerous coves dotted along the coastline. 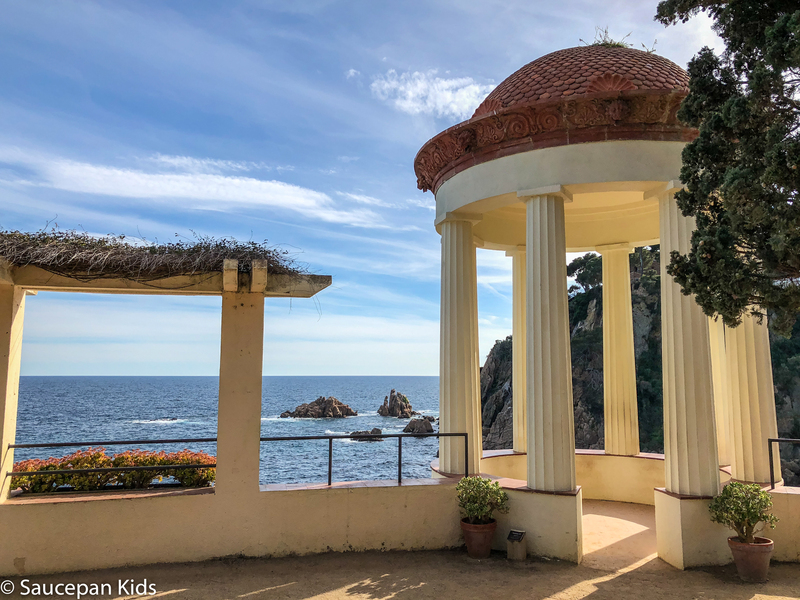 So what is it about the Costa Brava that has made it such a popular place for families to visit? 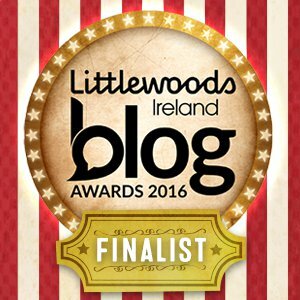 Well having experienced it for ourselves we have picked out our top twelve favourite things for families to do. Blanes is known for being the village which officially marks the start of the ‘Costa Brava’. 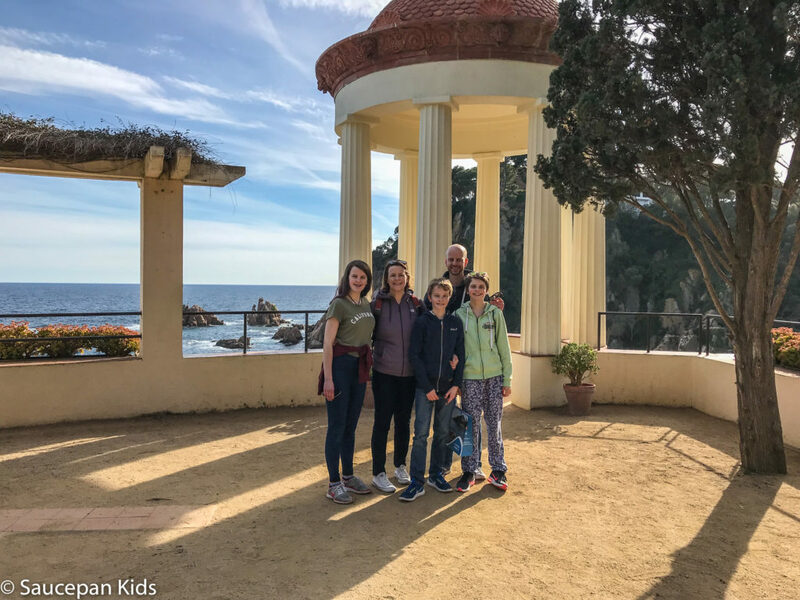 It is also the first town on the Costa Brava to obtain the prestigious ‘Family Tourism Destination Certificate’ so it was an obvious place to start our Costa Brava adventure. 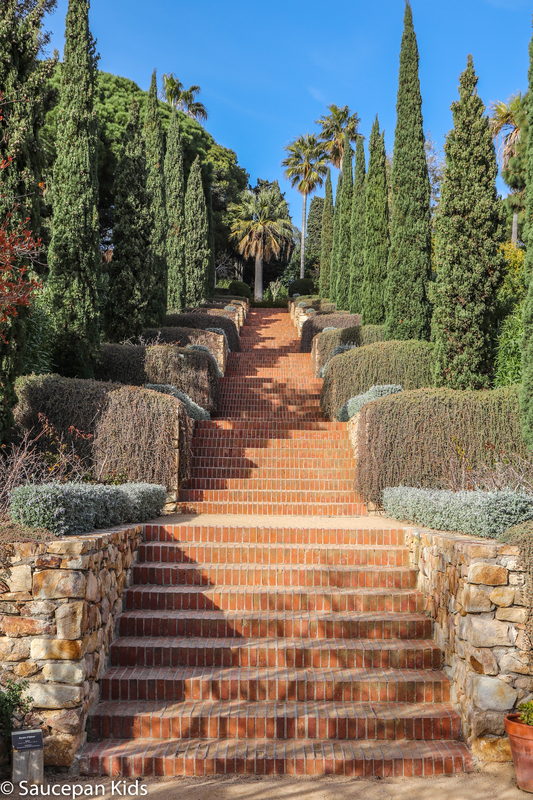 One of the most popular places to visit in Blanes is the Jardí Botànic Marimurtra Botanical Gardens. These gardens are renowned within Europe and are located a short walk beyond the end of the Balnes promenade. 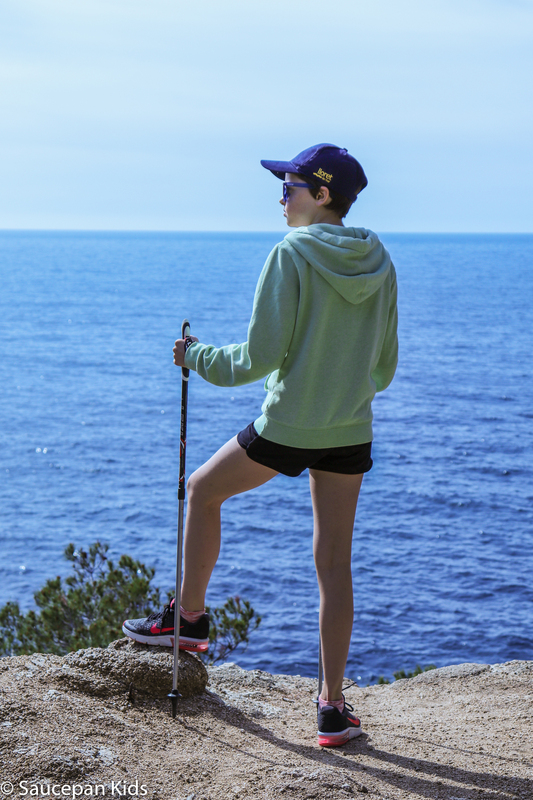 The walk alone is worth it for the stunning vista back down over Platja de Blanes beach. 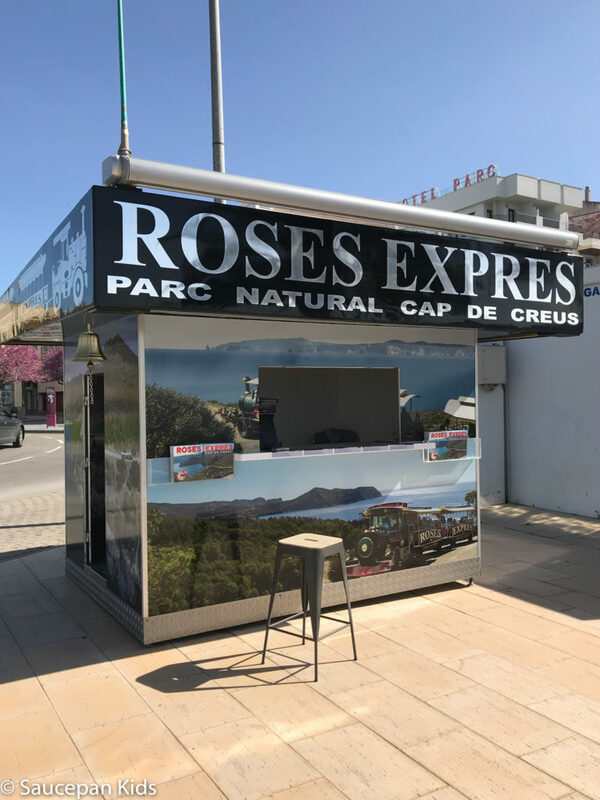 There’s even a tourist train from the centre of Blanes (Placa de Catalunya) to the gardens every 20 minutes during high season. It’s worth noting that there’s limited space for parking outside the gardens. Our guide around the gardens was a lovely local lady called ‘Neus’ which actually means snow in Catalan. She was proud to tell us that the Botanical Gardens were home to over 3000 exotic species. The gardens themselves are split into three zones, subtropical, temperate and Mediterranean and were setup over 80 years ago by German Carl Faust, who was passionate about constructing a centre of botanical scientific investigation. Apart from enjoying the array of plants, you’ll be distracted by the stunning views as the gardens are situated in a breathtaking coastal setting. Allow yourself extra time to sit on one of the perfectly situated benches and take in the vista. If you forget to bring your own drinks and snacks, there’s a lovely cafe on site. Let me first of all say that Nordic Walking is not just walking with poles which I’ll be honest I was guilty of thinking prior to this activity. When you hold the poles correctly, you get a great upper body workout and it also makes walking on uneven terrain much easier. This is a sport that originated in Finland in 1997 by Marko Kantaneva and has since become a worldwide phenomenon. The very lovely Lourdes from Nordic Walking Estrajo gave us a quick lesson on the promenade after fitting us with our walking poles. 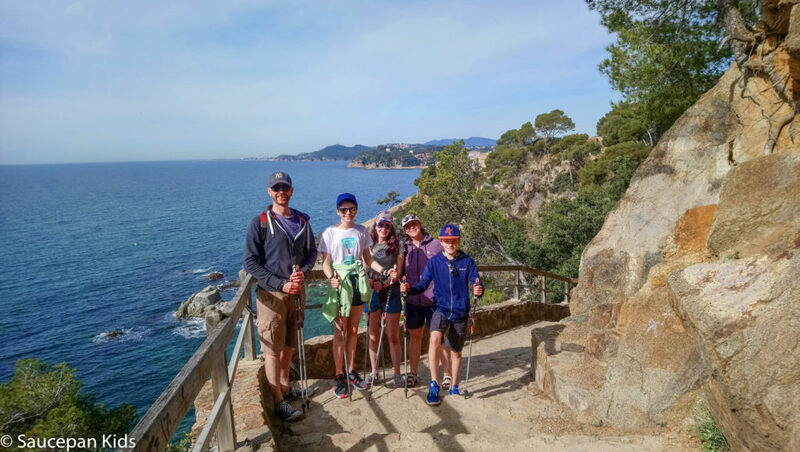 Our morning spent nordic walking around Lloret de Mar was one of our favourite family activities we enjoyed during our week in the Costa Brava. It was a wonderful way to appreciate the rugged landscape. There were numerous water and photo stops along the way in an attempt to capture the breathtaking scenery. I found it a serene way to enjoy the landscape and the fact that I was getting a great workout while spending time with the kids was a bonus. 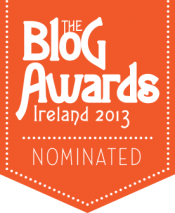 Nordic poles are top of our list of things to get since we returned to Ireland, kids included! 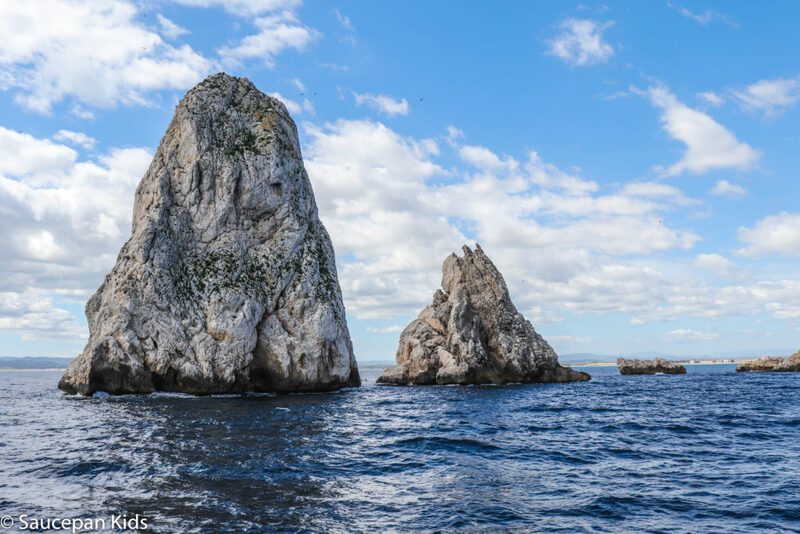 The Medes Islands, located just a mile off L’Estartit beach, are an archipelago made up of seven islands and have been a protected marine flora and fauna reserve for nearly 30 years. The necessary protection of this reserve over this time has enabled the marine environment to recover dramatically. One of the best ways to enjoy the Montgrí coas is by snorkelling, which has strict regulations to preserve this natural marine park. 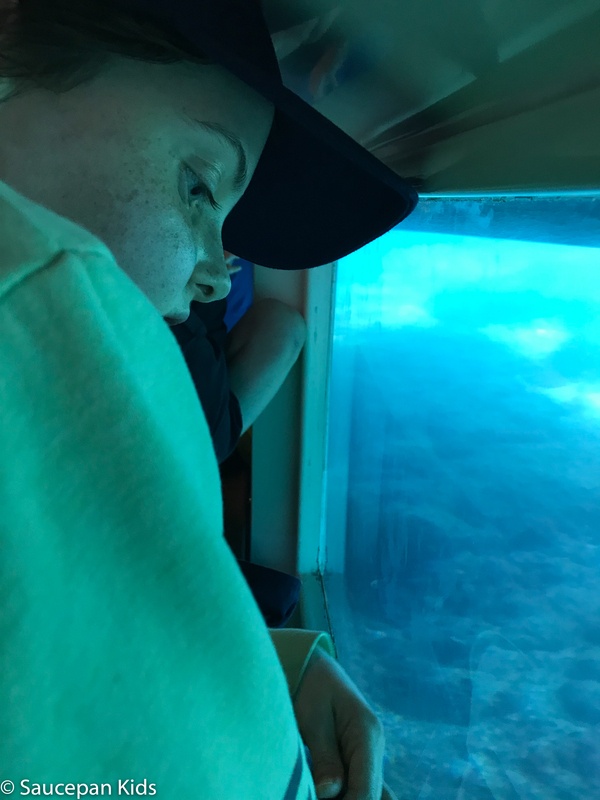 The second best way is on board the Nautilus boats which have large submerged windows, allowing those on board the opportunity to view the beauty of the vibrant seabed from a unique viewpoint. 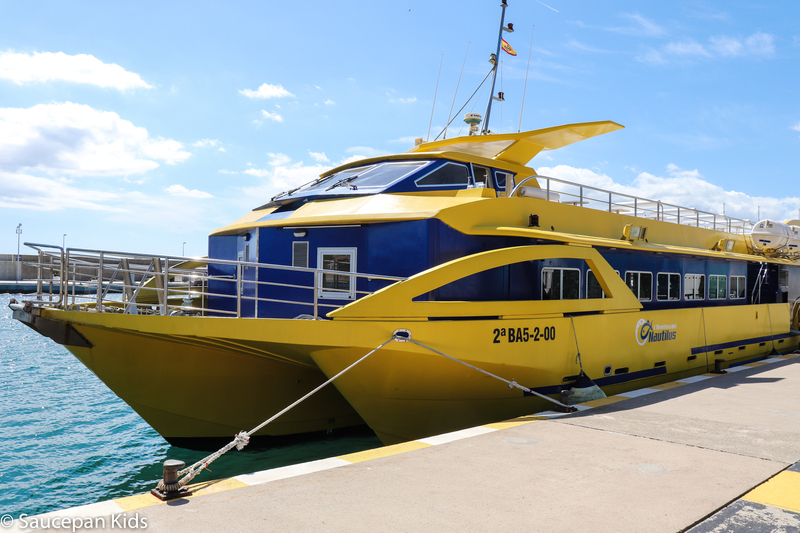 Lasting from 90 minutes to 3 hours, you have a choice of three interesting routes with Nautilus around the Medes Islands. 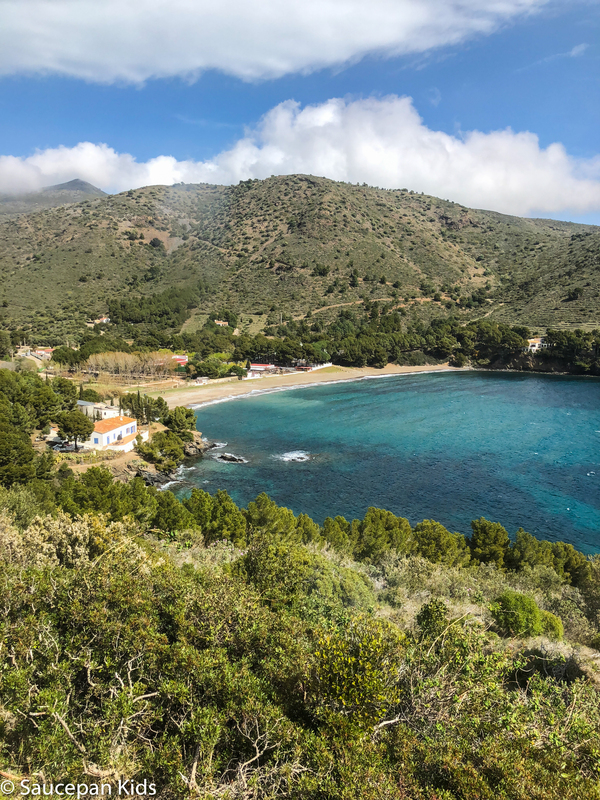 Certain routes even include the opportunity to jump off the boat and enjoy a cooling swim in the Mediterranean, They’re open all year and tickets can be booked online or from an official ticket kiosk near the beach. 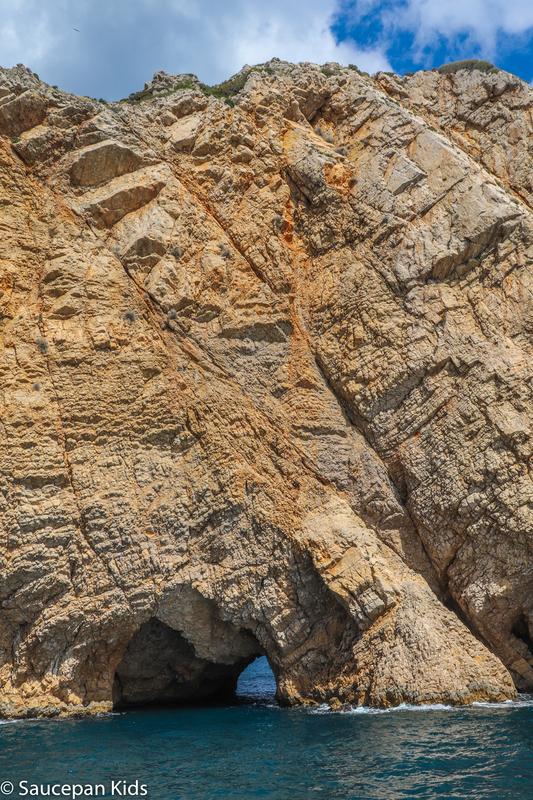 We all loved our boat trip and the opportunity to get so close to the famous natural arch of Rosa Foradada and the Medes Islands themselves. 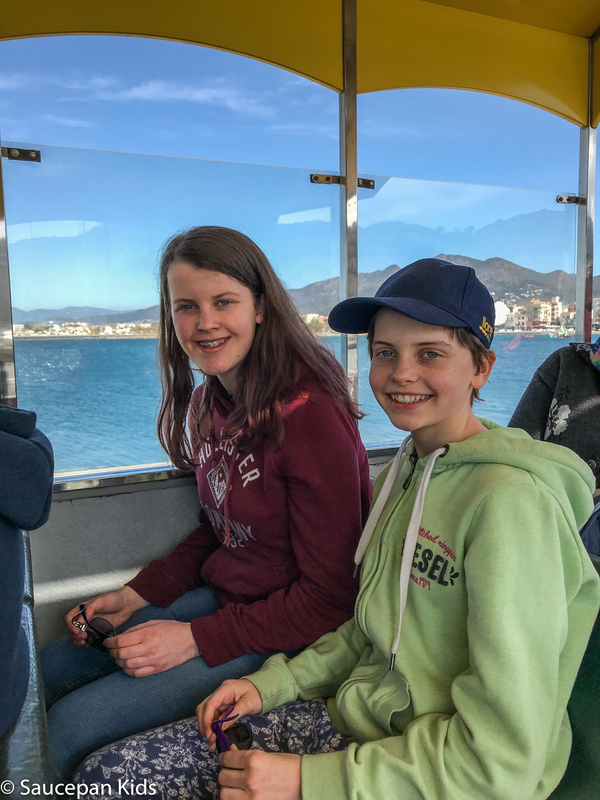 The kids particularly enjoyed seeing the seabed from the glass bottomed boat and trying to identify the different species of fish and coral. For those of you who haven’t heard of a Via Ferrata (me included), it’s a protected climbing route who’s concept dates back to the nineteenth century, but they are often associated with the First World War, when several were built in the Dolomite mountain region of Italy to aid the movement of troops. 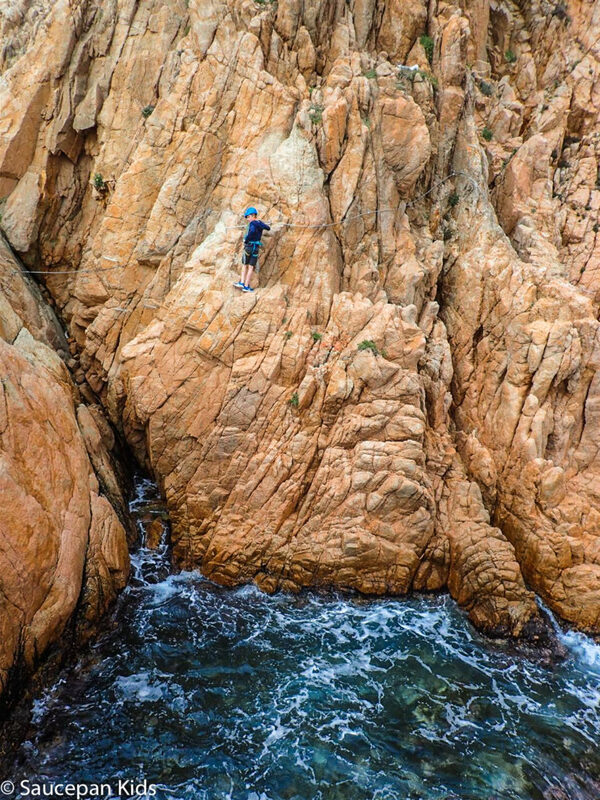 Located in the coastal town of Sant Feliu de Guíxols, the Sant Feliu de Guixols via ferrata is the only one in Europe at the edge of the sea. 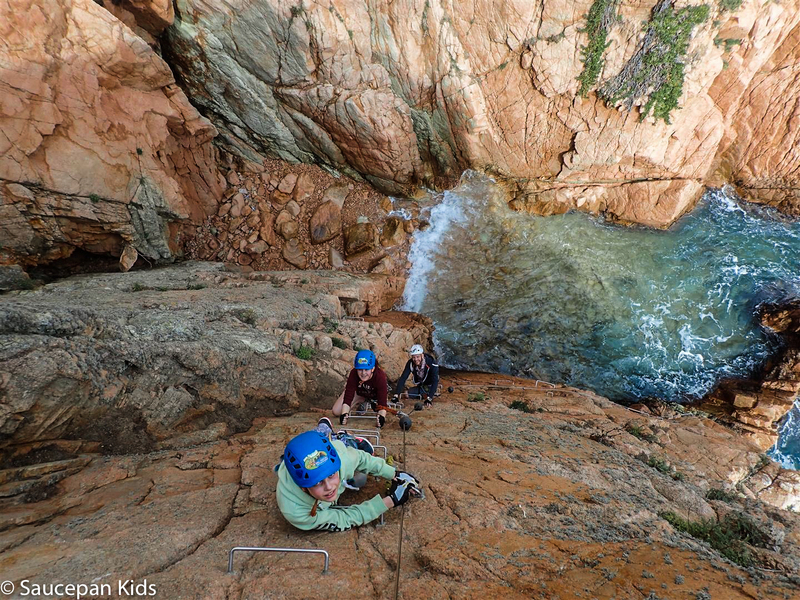 Making your way on the edge of a mountain is surely one of the most exhilarating way to discover Costa Brava. 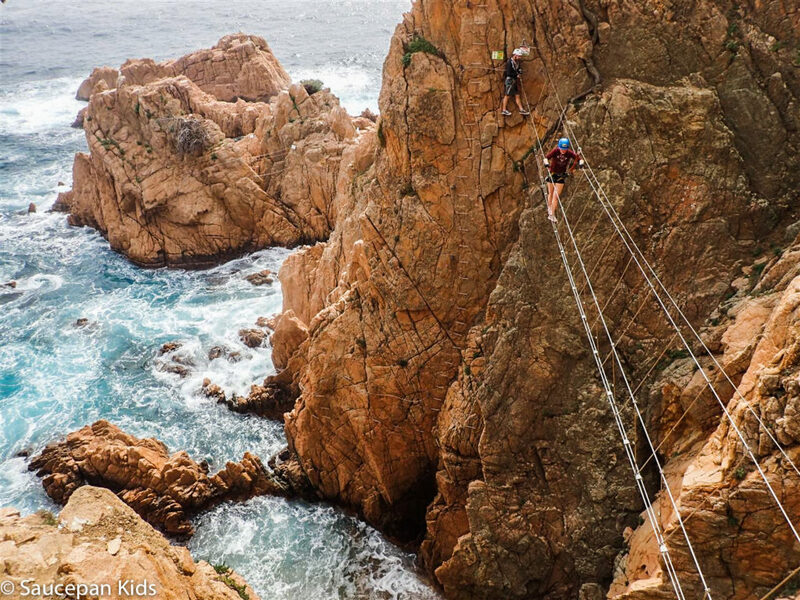 This makes it extra dramatic as you’re climbing with the Mediterranean sea crashing below you. It’s free to do but it’s essential that you have the correct equipment and have experience. The route is divided into two stages, easy and medium. of easy and medium difficulty. Halfway around, the users who do not want to complete the second, more demanding section can return to the starting point by climbing another road with security cables. 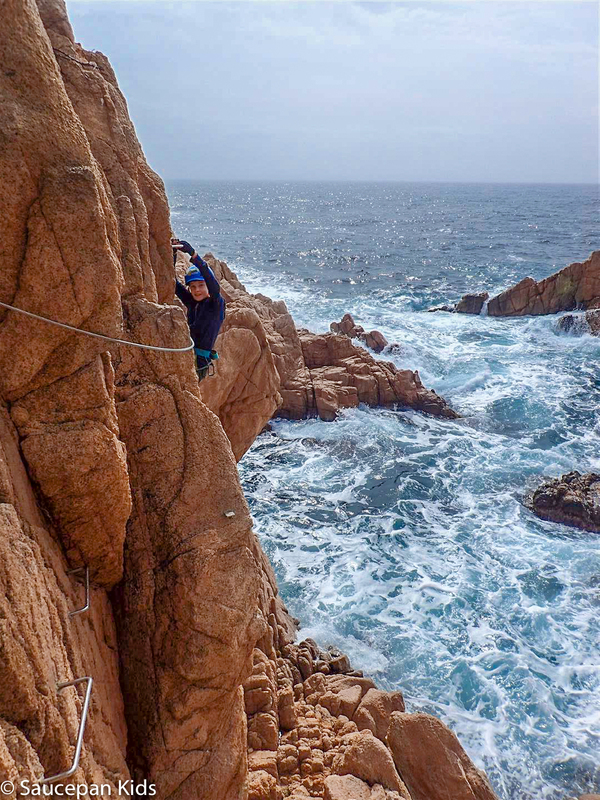 There are nearly 500 meters of ascent and descent, between cliffs of living rock and an average height of about 10 meters above the waves. 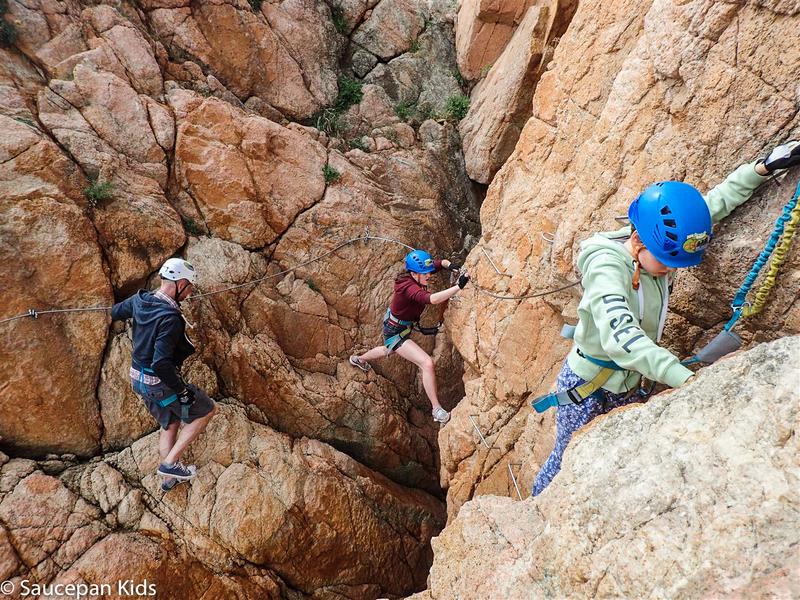 We met our tour guide and Via Ferrata Sant Feliu de Guixols course creator Albert who reassured us that this was a safe activity for us and that the kids were the perfect height. After being fitted with the necessary safety harness equipment, Albert then took James and the children on the experience of a lifetime. I wasn’t able to take part as I didn’t have the correct footwear, mind you I’m not sure I would be brave enough to have taken part anyway. Their trail took over one hour to complete (the first family friendly section) and when they came back they were all buzzing with adrenalin. 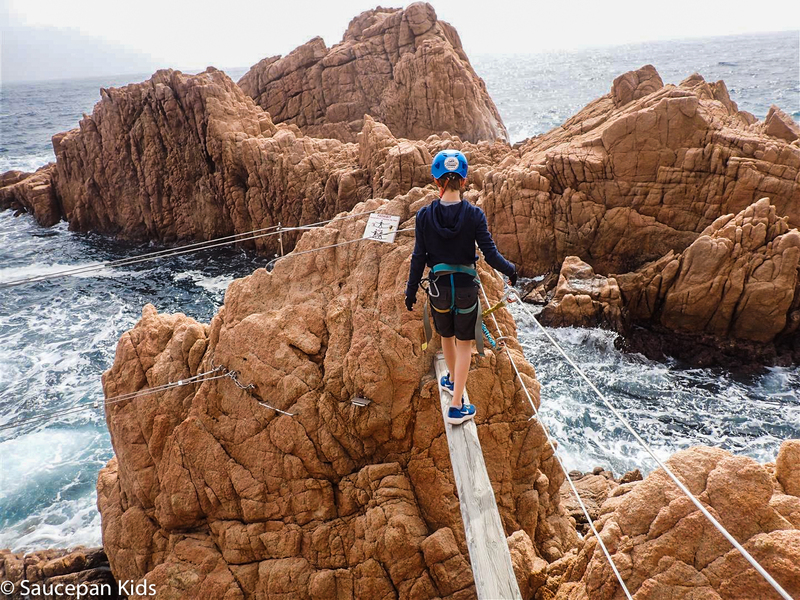 It’s certainly not for the faint hearted and I can see why you have to be at least 10 years old to be able to manage the trail. There are more difficult levels available but you must only complete those levels when you are experienced and have the suitable safety equipment as it can be very dangerous. This is definitely not an activity for the faint-hearted or anyone afraid of heights but is an incredible experience for any thrillseeker. 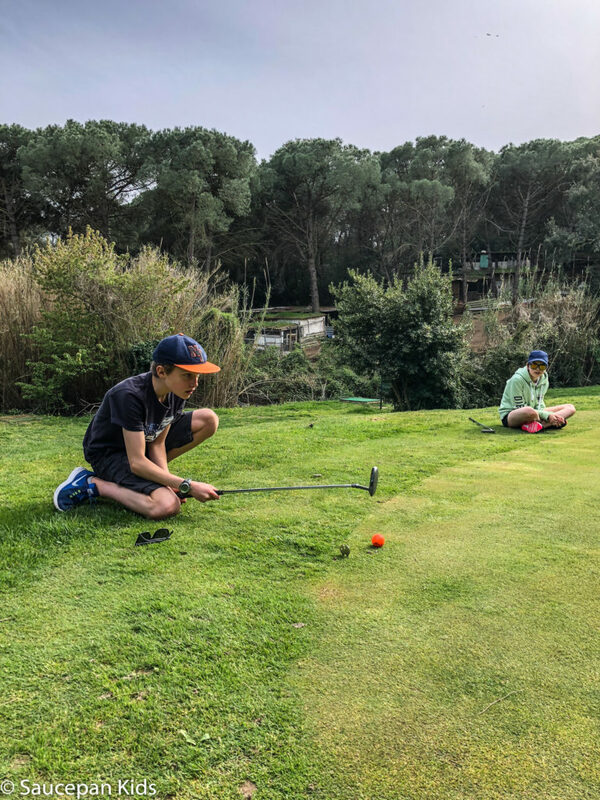 When visiting the popular tourist destination of Lloret de Mar, you’d be tempted to spend all your time near the Mediterranean beaches but why not try a different kind of family activity? 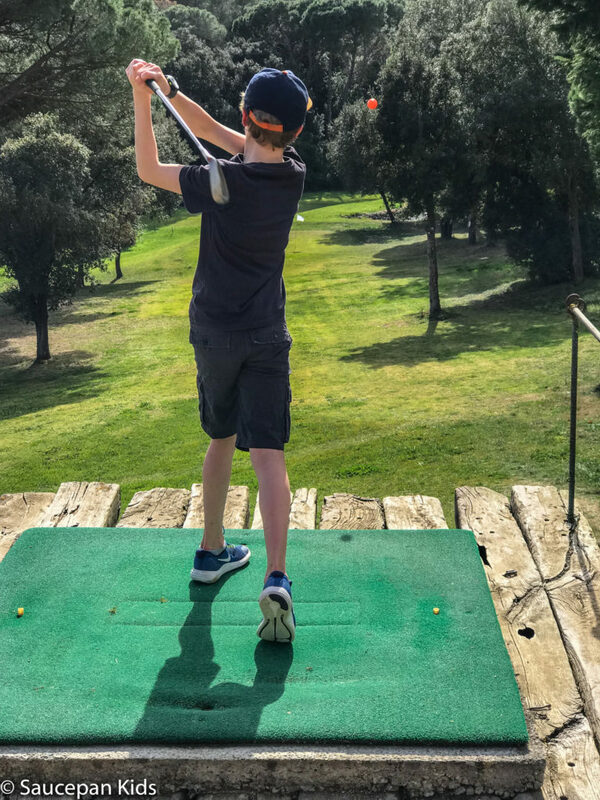 Why not have a golf lesson at Golf Lloret Pitch & Putt? 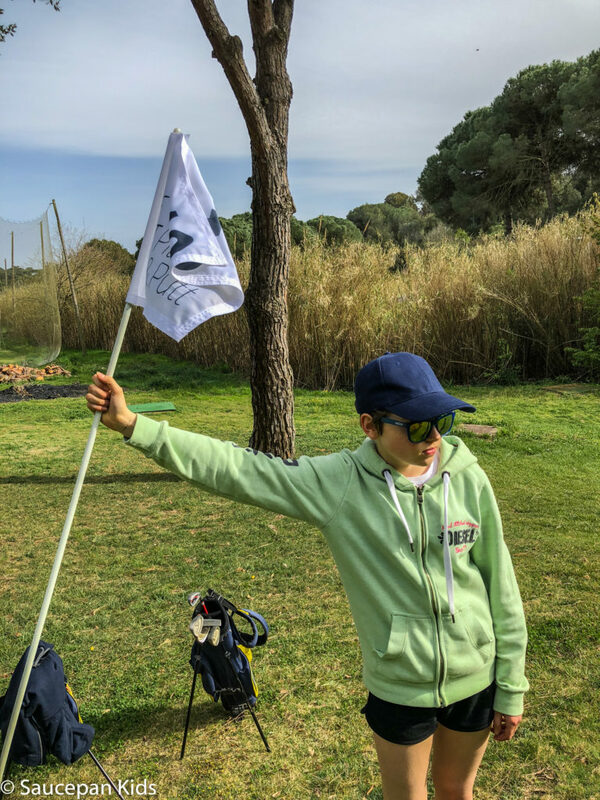 We spent a fun-filled few hours having a private family lesson with Jordi who is a semi-professional golfer with the patience of a saint. 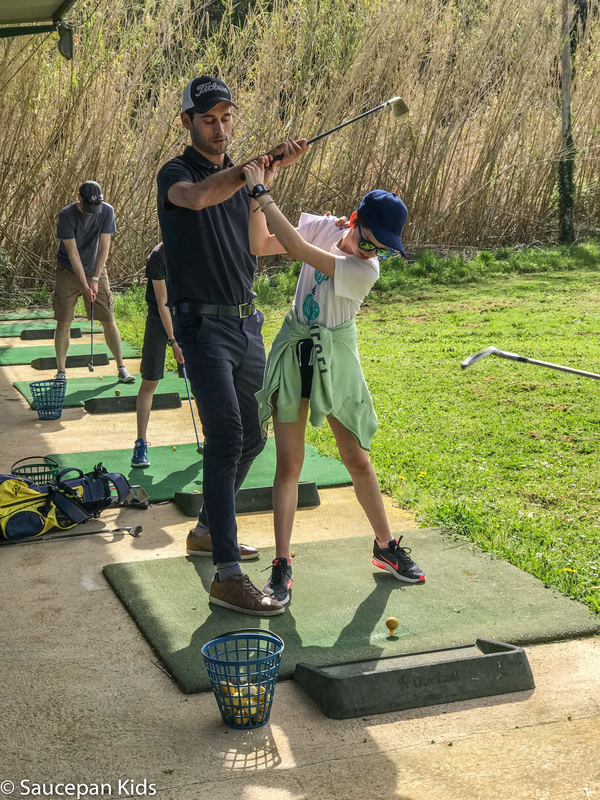 We first spent time ‘perfecting’ our technique at the driving range before hitting the proper course. 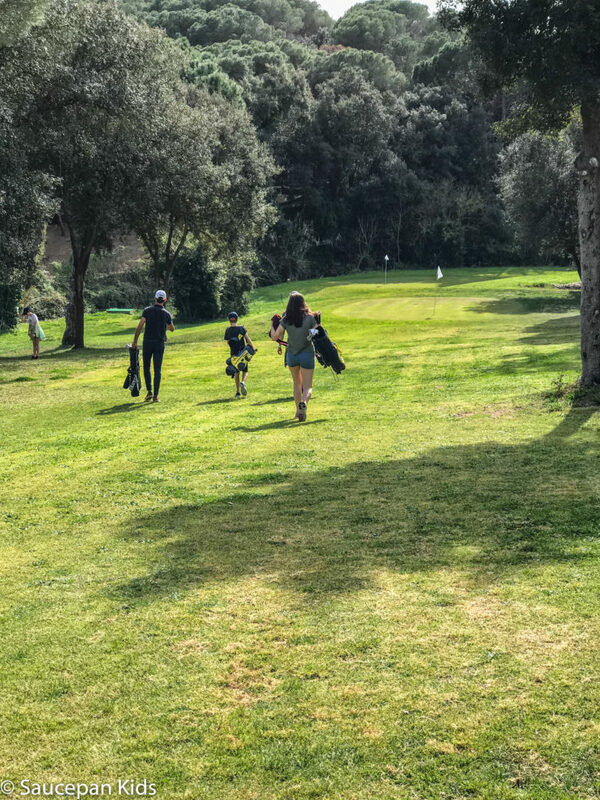 Although none of us are golfers, we loved the opportunity to play together in the Catalonia sunshine and get some exercise while we were at it. 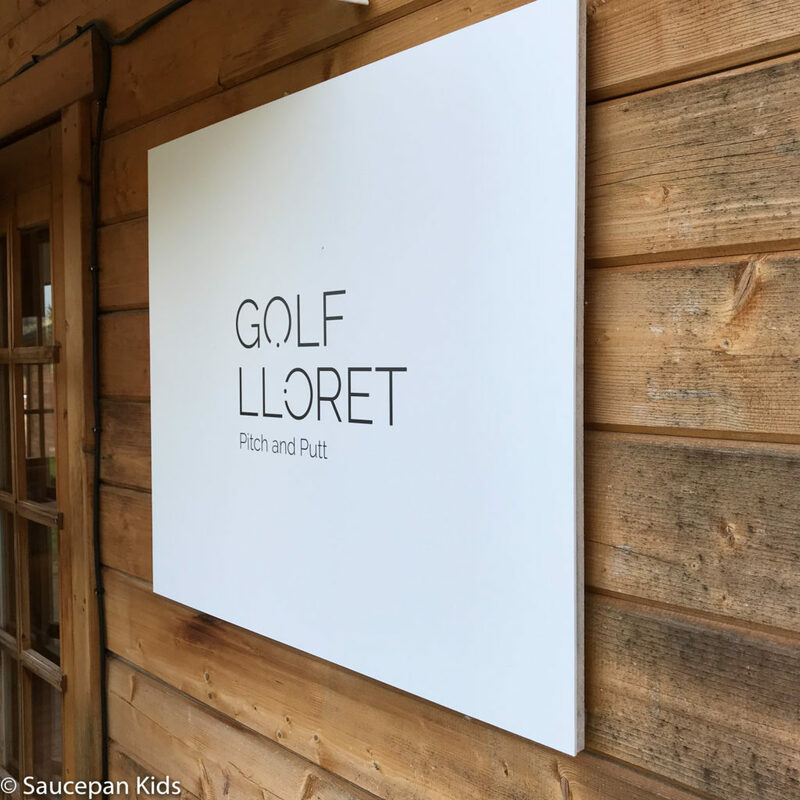 After our lesson and play we headed to the 19th hole for tea and cakes and a well earned sit down in the shade after our fun time at Golf Papulus. Mas Mollas is located in the Conca del Tinar de Calonge valley. 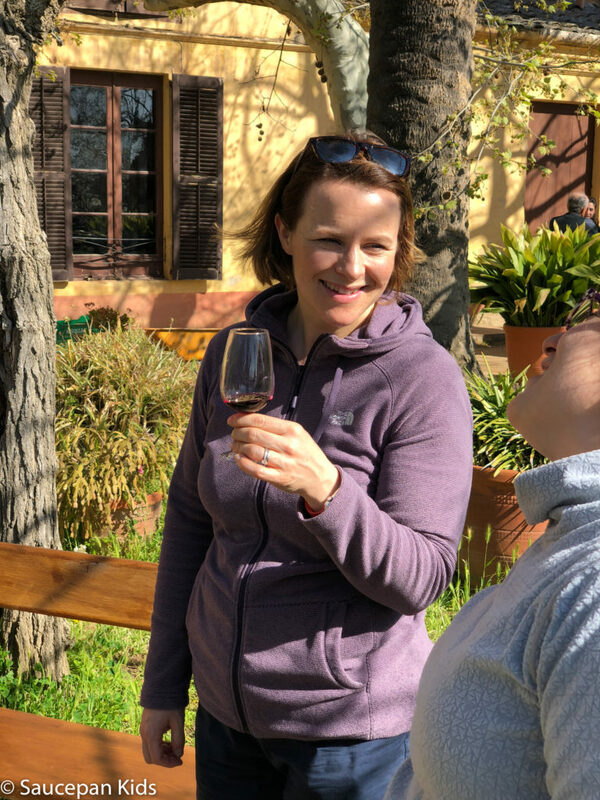 We were welcomed to the the rural farmhouse by Neus, one of the first generation of women in the Molla family (since 1338) to run the winery. As Neus showed us around, she proudly told me how her father retained a traditional family farming method even when he was under pressure to industrialise Mas Mollas as so many other farmers in the area had already moved over to a more ‘efficient’ method of growing and harvesting their grapes. Now, many of those farmers are wishing they had stayed true to the traditional methods of wine production like Mas Mollas had. They now sell their year round wine to their loyal client base of local restaurants, hotels and shops. 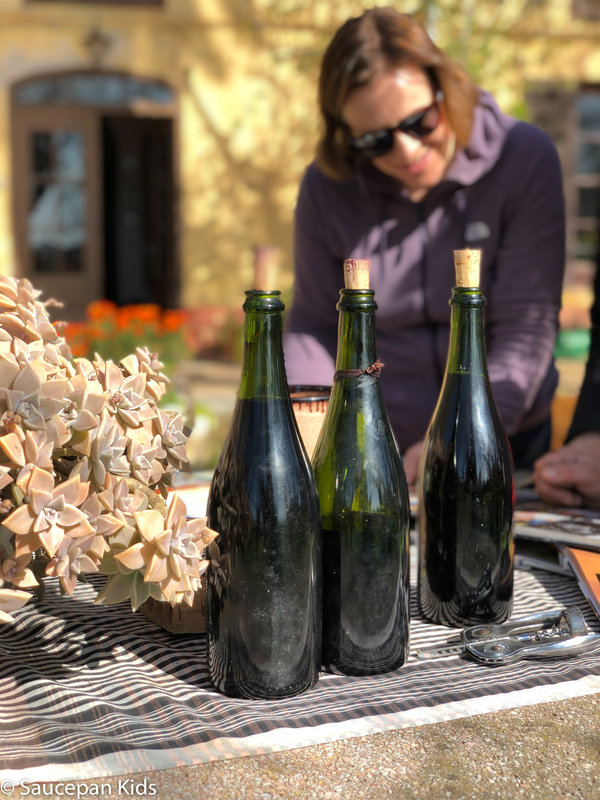 They not only produce incredible wine but they also use the orchards surrounding the farmhouse to grow and sell fruit in the local markets during the summer. James and I had the opportunity to taste three different wines, all very different but equally delicious. 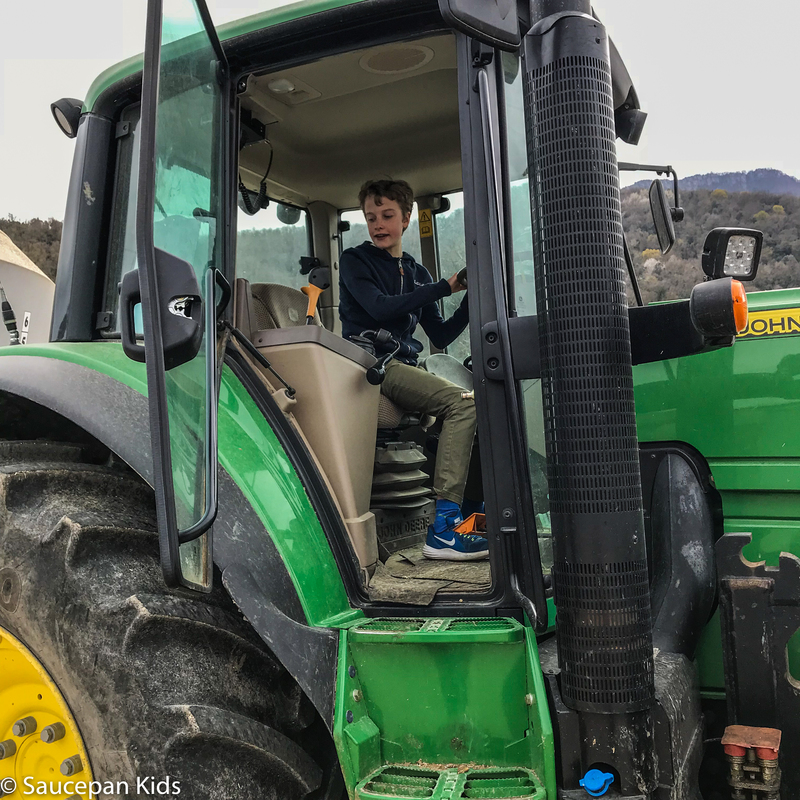 A family visit to a winery might not seem like a very family friendly thing to do but actually you’d be surprised how much our three kids enjoyed it. They loved the guided tour (apart from the strong grape smell). They were fascinated with the chemistry behind the process but more than anything they were blown away by our tour guide’s passion for what her family do. 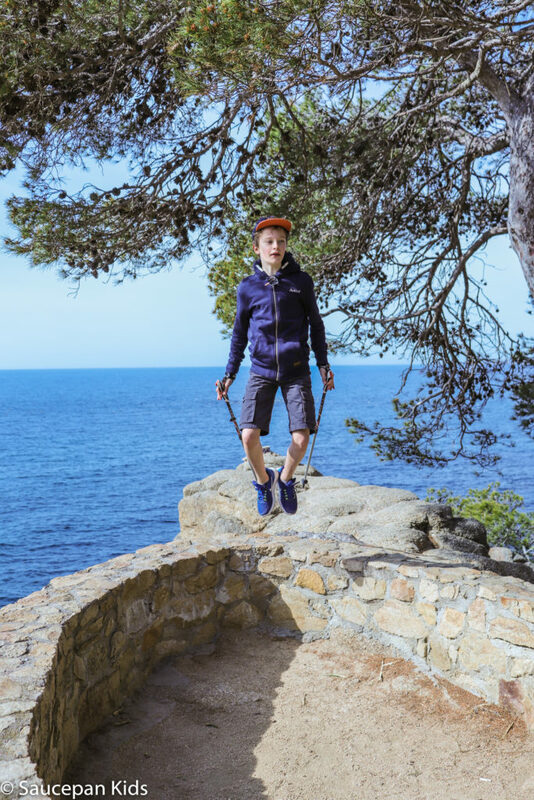 This was probably one of our favourite things that we did on our Costa Brava trip. 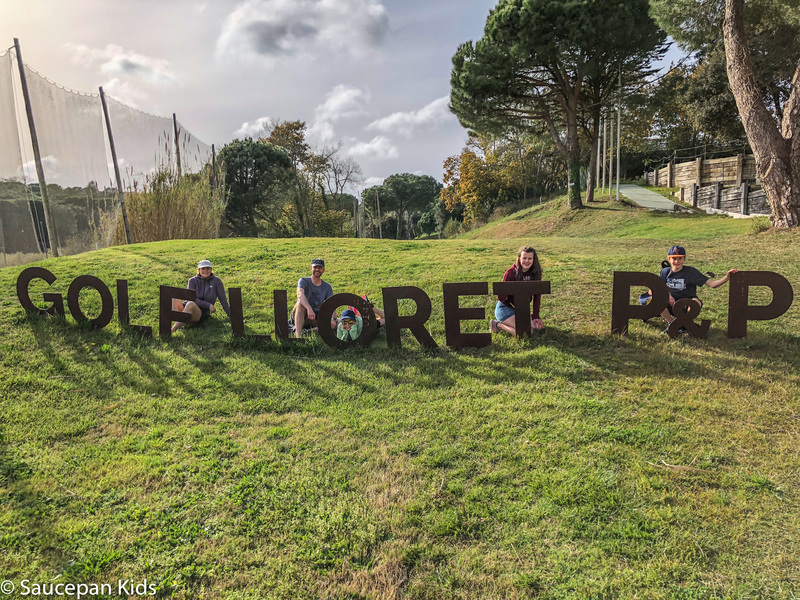 Our tour started at the centre for culture and nature in Can Trona in La Vall d’en Bas, in the foothills of the Pyrenees, about an hour from Girona. Incidentally, the centre itself is well worth a visit. Eduard, our guide, who’s English was thankfully much better than our Catalan, started by teaching us how to ride a Segway and gave us the all important safety information. 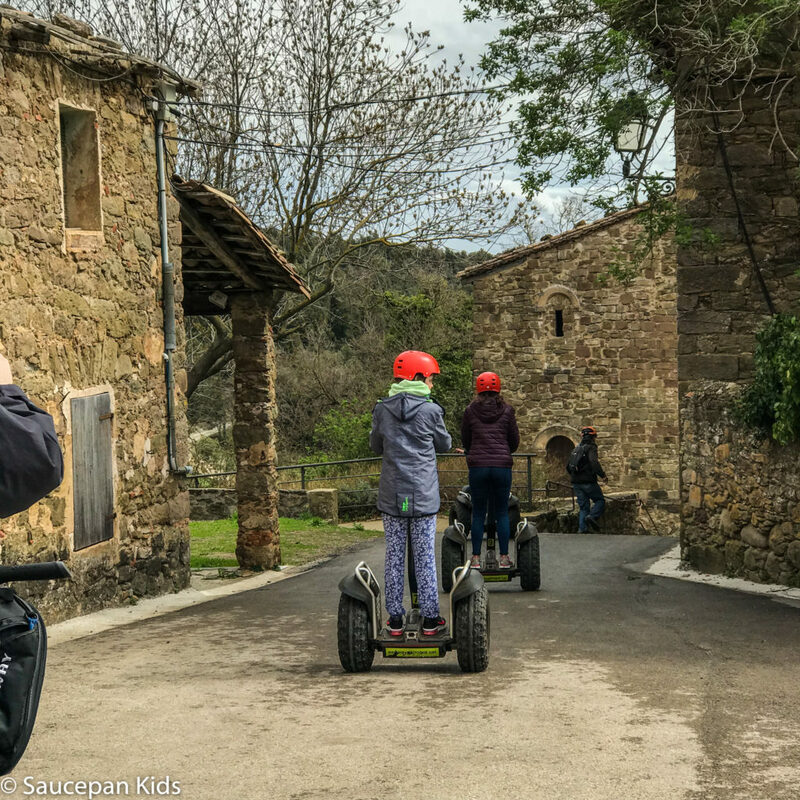 As with most things the kids picked up how to ride the Segways really quickly and were soon running rings around us adults. After a little pootle around the car park, confidence gained we headed off into the countryside. When I say countryside I really mean it! After a few kilometres on quiet local roads we headed off-road, onto grass, over bridges and up some fairly steep hills. All along the way Eduard made constantly checked up that were all doing ok as well as explaining to us what we were seeing. 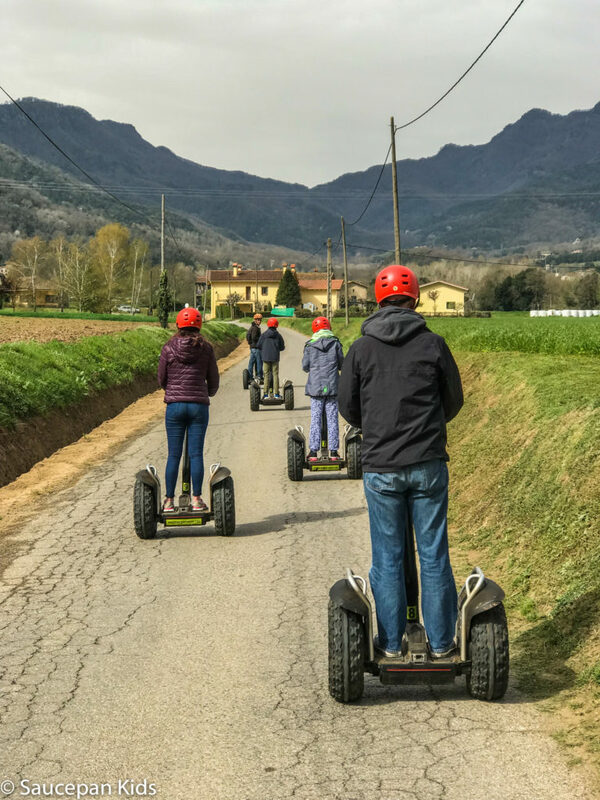 Segways are a brilliant way of seeing the countryside, you can see much more than walking will allow and it will let you go to places you might struggle to reach by bike – and it’s a lot less tiring than both! It also amazed me how quickly I got used to the initially alien controls, with starting, stopping and turning soon becoming instinctive. I’m not usually the most adventurous of people and would ordinarily not have thought about doing this, however I’m so glad we did do it as it was very much a highlight of our stay. 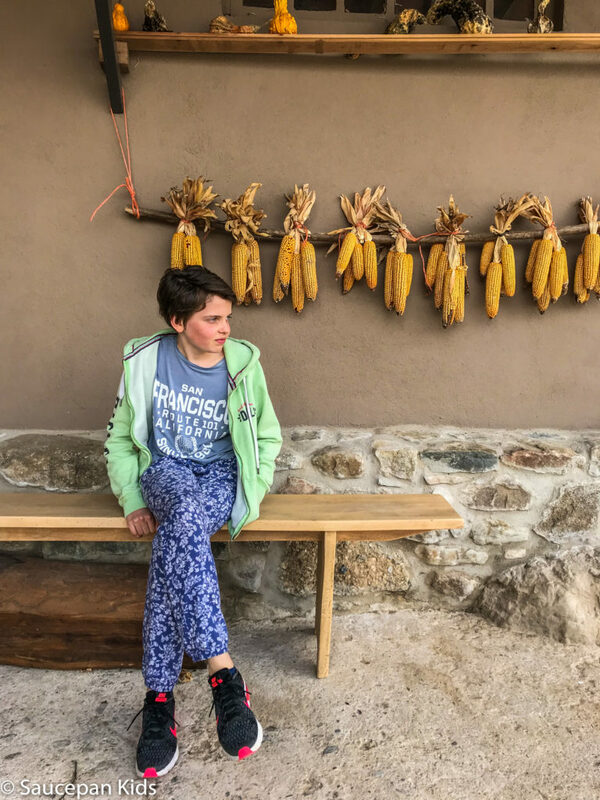 Nestled in the rural area of La VALL D’EN BAS is the charming organic dairy farm, Mas La Coromina. 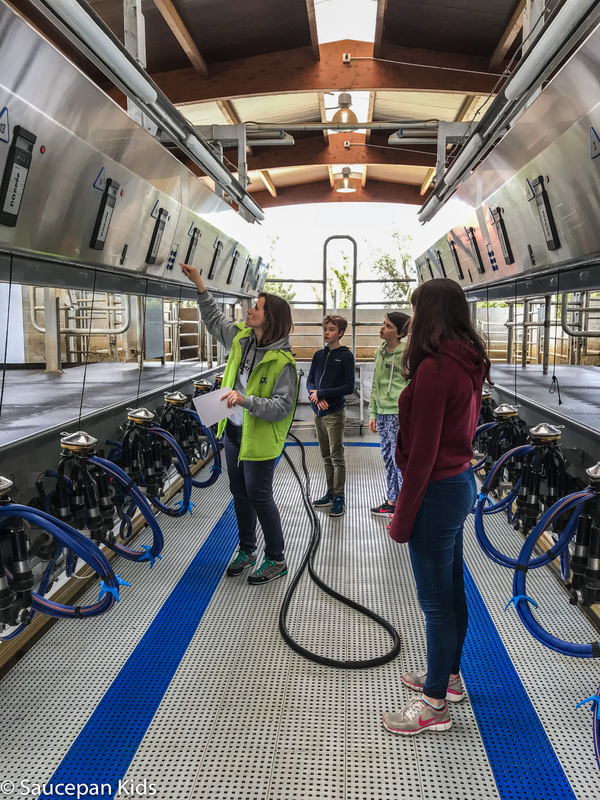 This 4th generation family run farm has more than 400 cows and calves which are milked three times a day which you can see if you time your tour well – the first milking is at 4 am mind you, so definitely not an option! 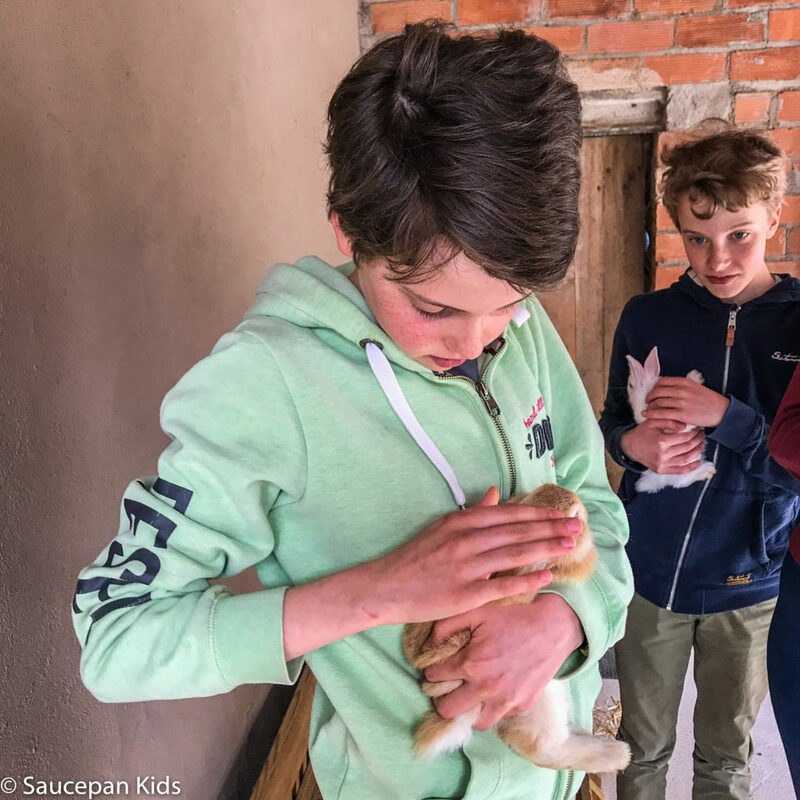 When we visited we were able to meet the calves and the kids had great fun feeding the cows with fresh grass as well as seeing bunnies and chickens. Our guide, Isabel, who is a member of the family and speaks great English, explained to us how the fertile soil in the area means that the family are able to be completely self-sufficient. There is a well stocked, deli-style shop on site selling produce from the farm and other local delicacies. 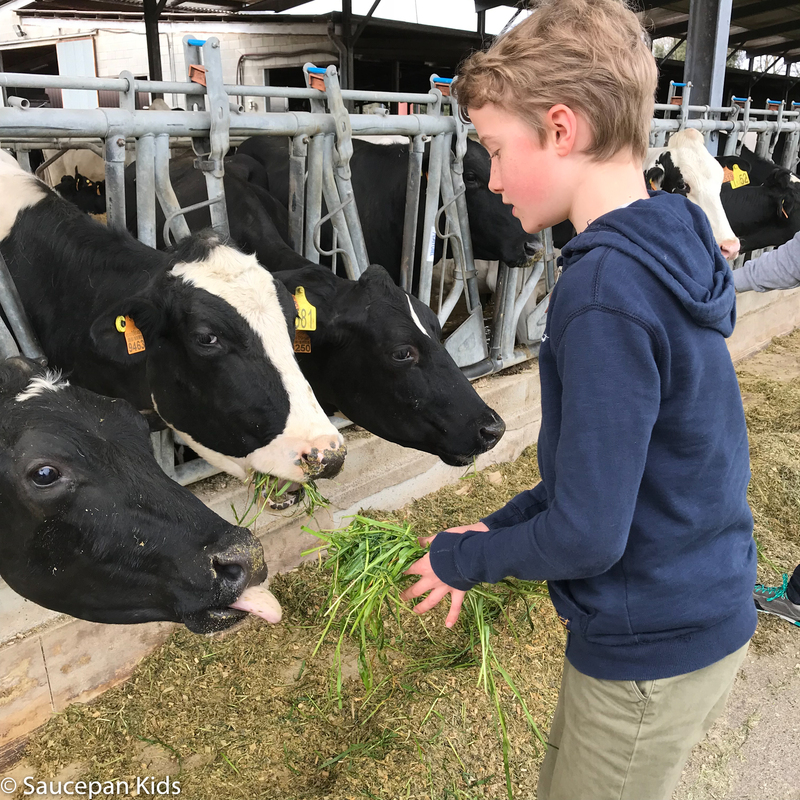 You can book a guided visit of the farm which is geared perfectly towards families and finishes with a taste of yogurts and cheese made with their milk. One of our favourite ways to enjoy any destination is just walking around, wandering, exploring the area. You can get a real sense of where you are, the local people, the local food and the culture just by walking around and taking in the area. One of my lasting memories of Catalonia is rambling along the coastal trail, mesmerised by the stunning landscape. Costa Brava Tourism have done a fantastic job making sure that visitors and locals can enjoy this unique and dramatic asset. The famous coastal hike GR-92 (Grand Randonee) route which crosses Catalonia and Spain along the Mediterranean coast is clearly marked with its distinctive red and white stripe painted onto the cliffside. 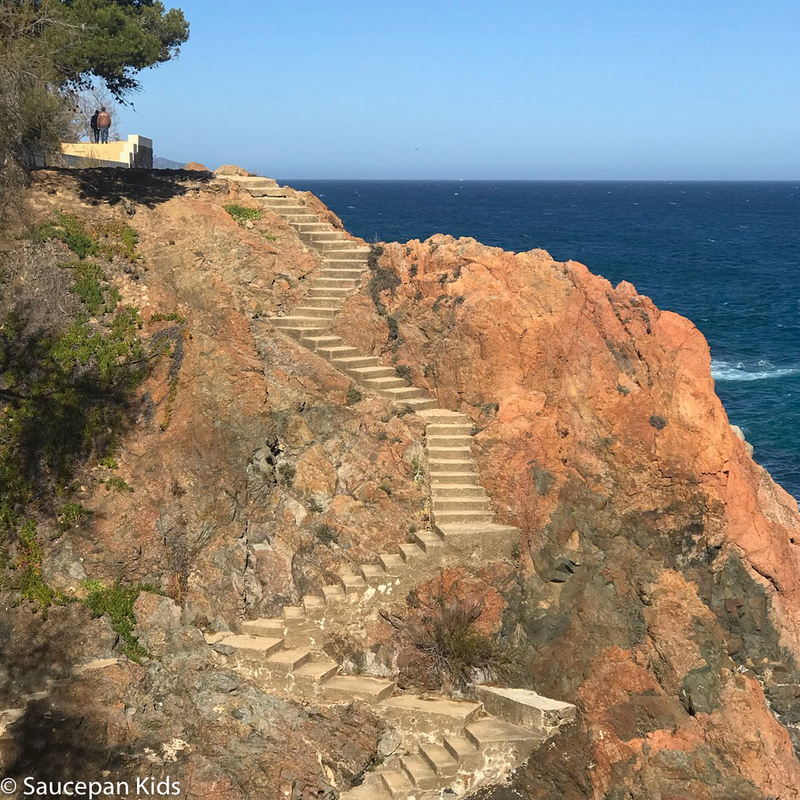 This trail is 583km long so you’ll get just a taste for the magnificence of this route when walking along the coastal path (‘camins de Ronda’) in Costa Brava. The pathways owe their name in Catalan to the ‘rondes’ or guards who traditionally patrolled the area, following the line of the coast as they kept an eye out for smugglers. Why not booked a guided walking tour so that you can find more about the rich history of the area. 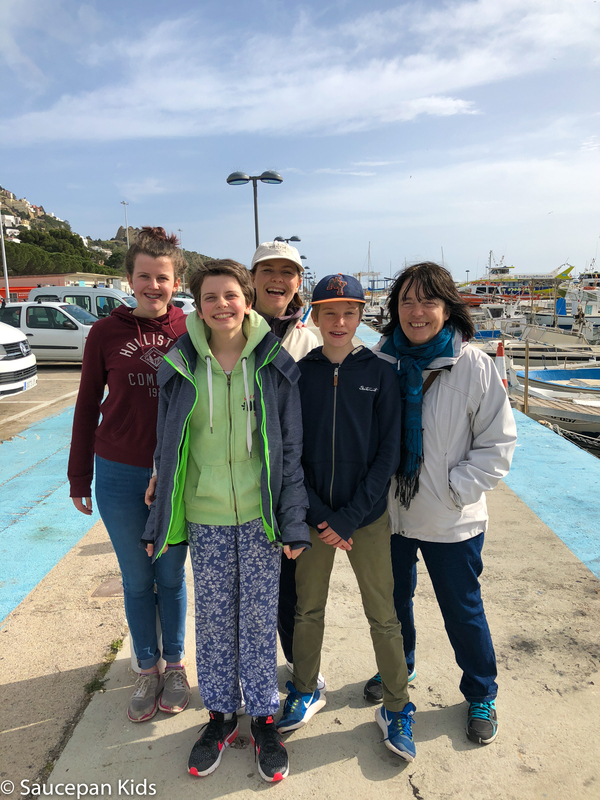 We met with Roser from Platja d’Aro Tourist Board who gave us a fascinating guided tour as we walked along the coastal area from SANT ANTONI DE CALONGE to Platja d’Aro. 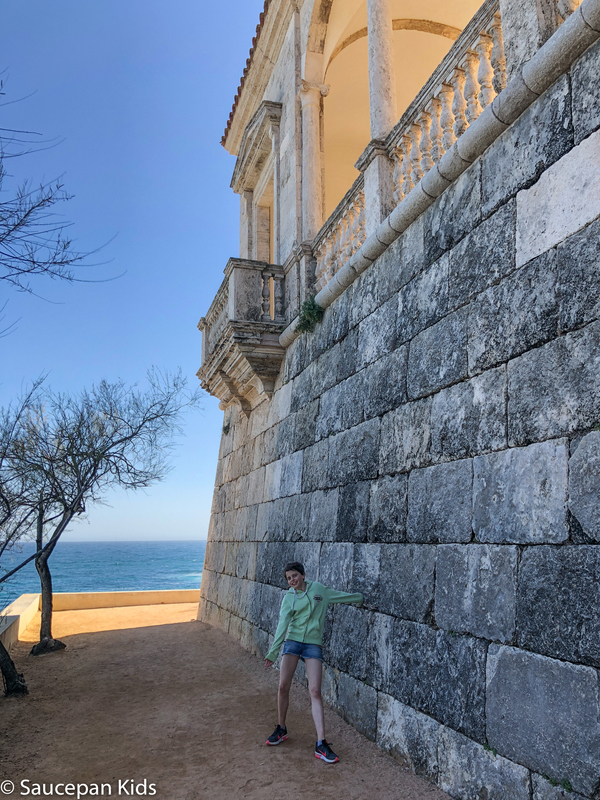 As we meandered alongside dramatic cliff faces, sandy beaches and hidden coves, I feel that she gave us a real insight into true Catalan culture. Spending a couple of hours on a train doesn’t seem like the usual way to sightsee and avoid the midday Spanish sun but this is no ordinary train. 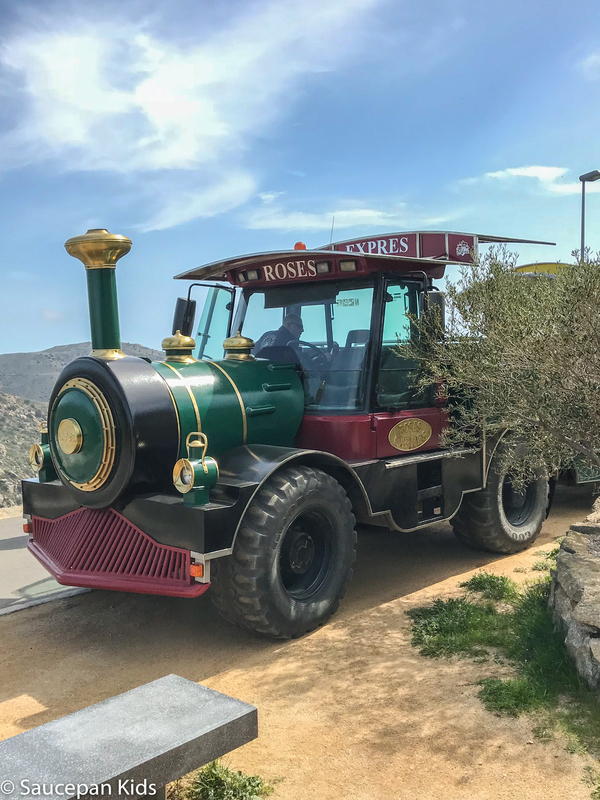 The Roses Express is a ‘road train’ which takes you up high into the Cap de Creus nature park. 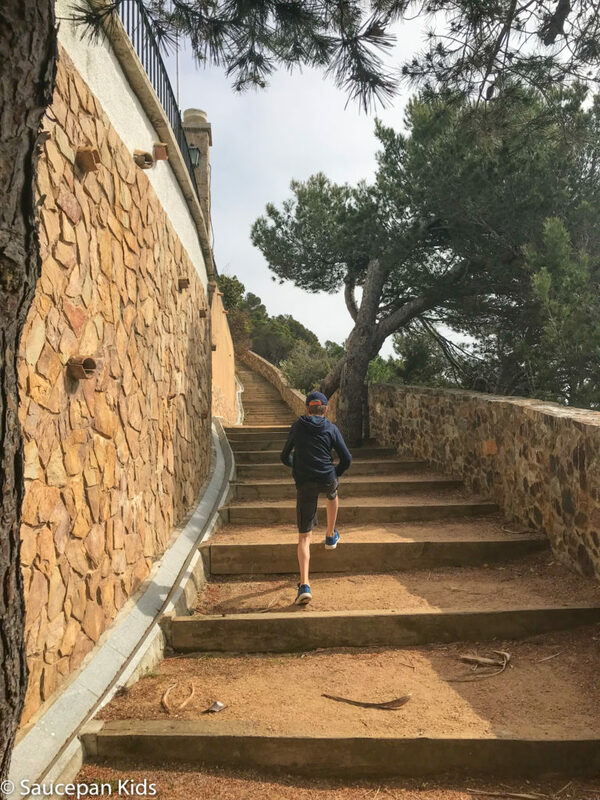 You have a choice of different routes, to Puig Rom, Falconera, Puig Alt or Jóncols depending on how long you have and what you’re interested in seeing. Our two hour trip took us through Roses and out onto the dusty tracks that cars just couldn’t negotiate. It’s such a unique way to view the hills and the peninsula, we loved it although it was quite bumpy and breezy. We appreciated the PA system which explained what we were seeing in various languages as well as English including the oft-repeated jingle “Roses Express – toot toot” which we are still singing now! At the top, we stopped for a break where the driver served a little sangria and homemade biscuits while we all took photos of the Bay of Roses. Remember to bring a light jumper for the top as it can be a few degrees cooler at the summit. You can prebook your tickets online or on the promenade in Roses. It’s worth noting that photos will be taken on board the train at one of the stops which you can choose to buy at the end if you wish but you don’t have to. 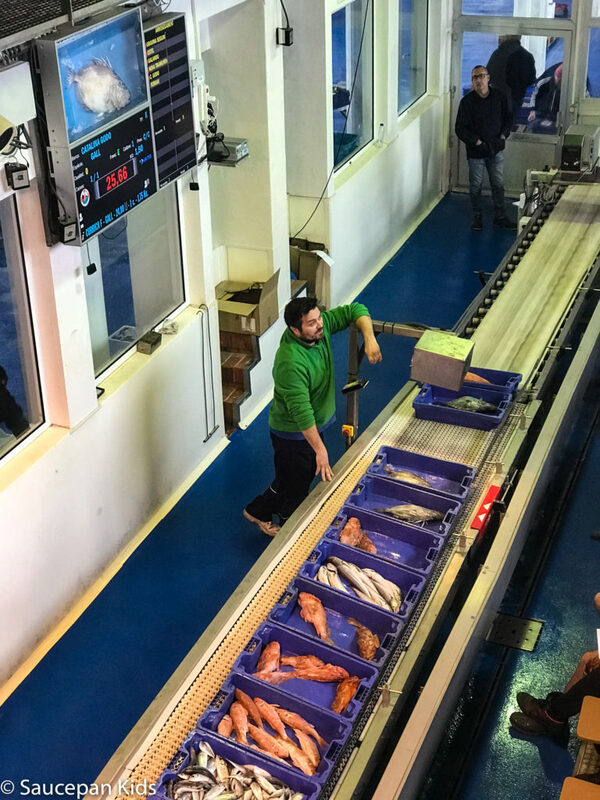 If you’d told me beforehand that visiting the fish auction in Roses would be one of the highlights of our trip to Costa Brava I would not have believed you. 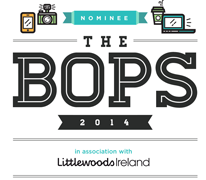 However, it turned out it was, with the kids putting it in their top 5 things we did! 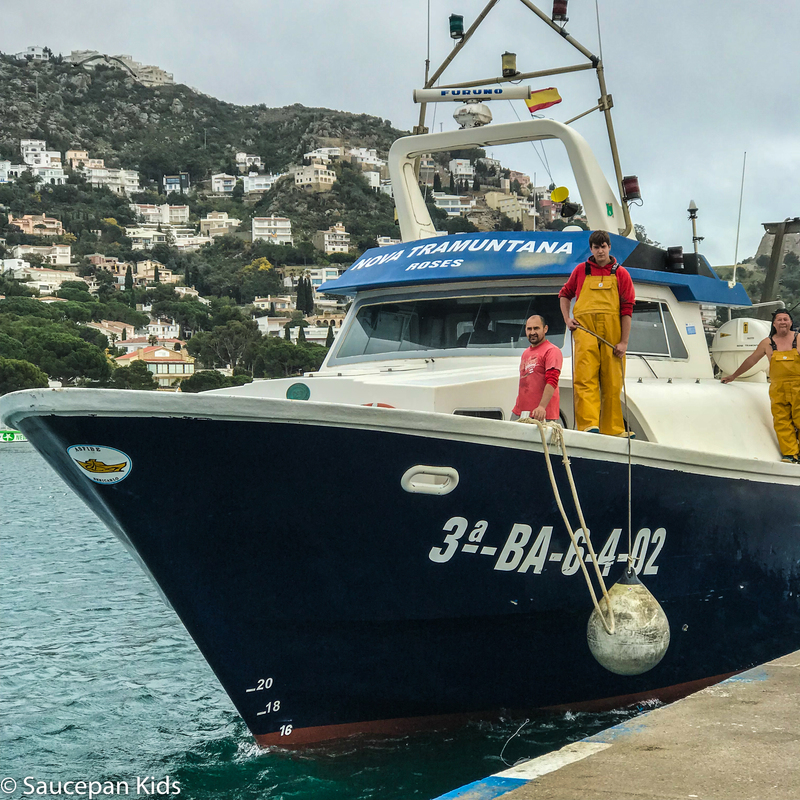 A major part of Saucepan Kids ethos is finding out where our food comes from so this trip was perfect, really showing us first hand how the fish we buy from shops gets there. 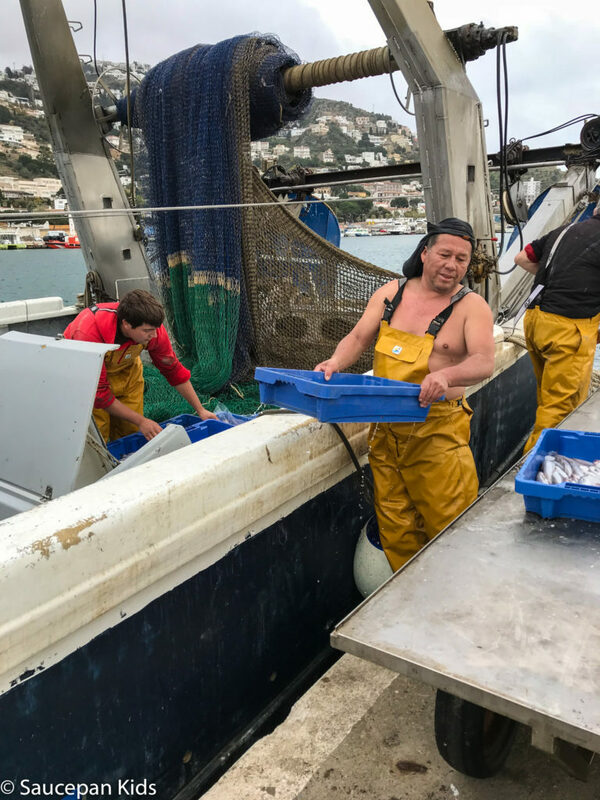 We met Roser, our guide, in the port and started off by watching the fishing boats returning from their day’s work (at 5pm) to offload their catches. From the quayside the crates of fish are transported the short distance to the auction on trollies. There is a viewing gallery overlooking the auction floor where we could see everything that was going on and Roser could explain how the selling works. The same boxes of fish we’d just seen being taken off the boats arrive on a conveyor belt and each box is sold in turn. Contrary to other auctions we’ve seen, here the price starts high and automatically drops until one of the buyers (small shop owners, large supermarket buyers and restauranteurs from many miles around) press their electronic ‘buy’ button. Everything happens very quickly and the kids loved trying to guess was price the fish would sell for. 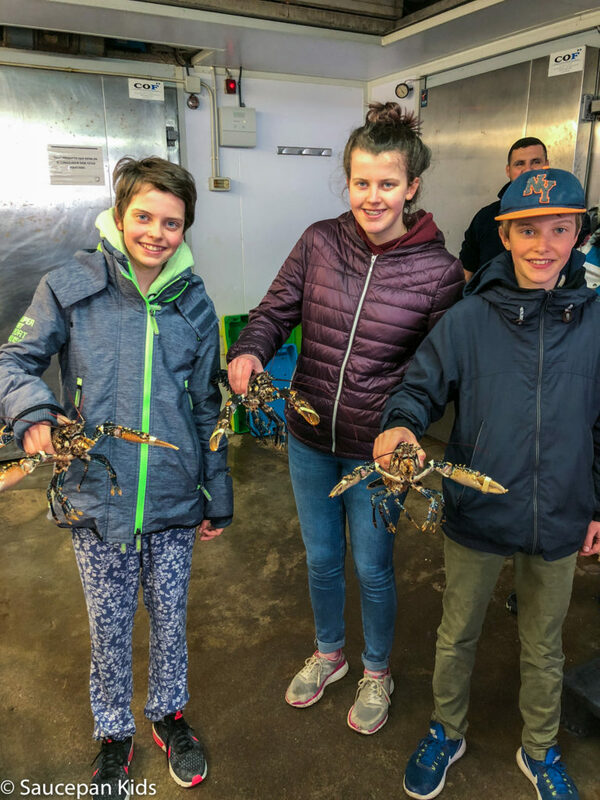 We finished off the tour in Roser’s favourite fish shop where we were introduced to some live lobsters. The Roses tourist office run regular tours of the auction and we’d highly recommend you take one – it’s a fascinating, alternative thing to do with the kids. 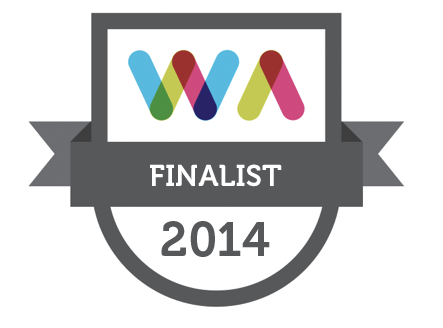 Another first ticked off for us. This was James, Anna and Fraser’s first ever yoga session and Ellen and I, regular yoga goers, have never had a class in a vineyard. 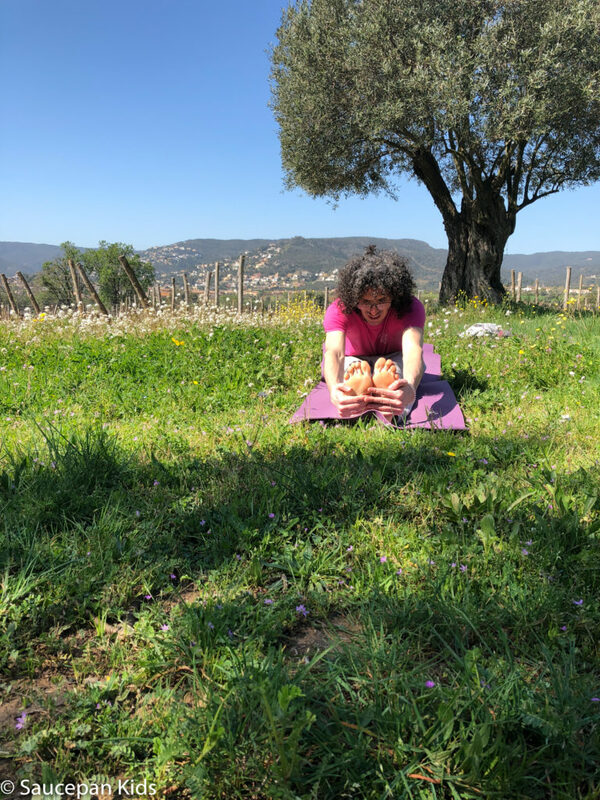 You don’t have to have the class in a vineyard, David from Món d’Harmonia has a studio, but in the beautiful scenery and fantastic weather it was an amazing experience. This is not your run-of-the-mill holiday experience and not probably at the top of anyone’s list but actually it should be. Holidays are about getting away from our day-to-day lives and relaxing so a yoga session is just the ticket. Even James, who by his own admission would be rather self-conscious in these situations, relaxed and thoroughly enjoyed himself, even to the point of now doing some yoga at home. David was an excellent teacher, he was calming and put us at our ease, managing to contort James into various poses he would not have thought possible. 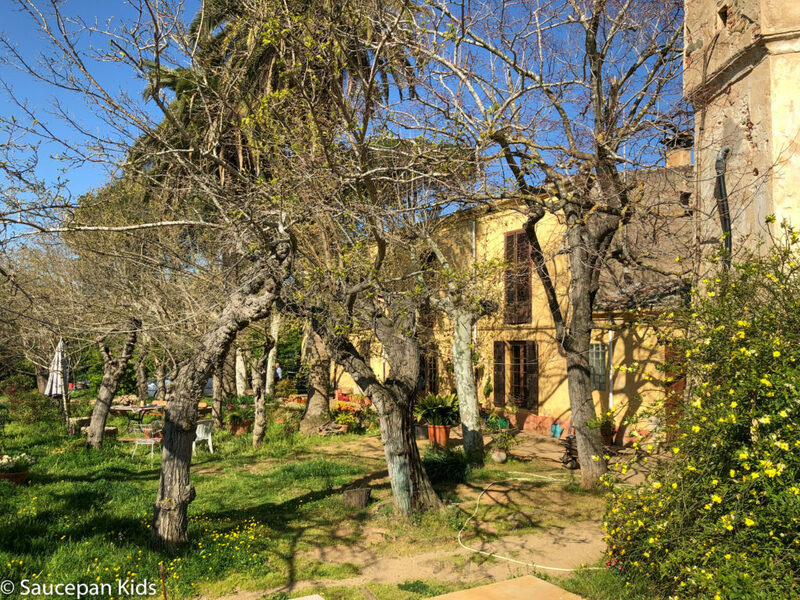 So, think differently and book a family yoga session on your trip to Costa Brava – your well-being will be grateful. 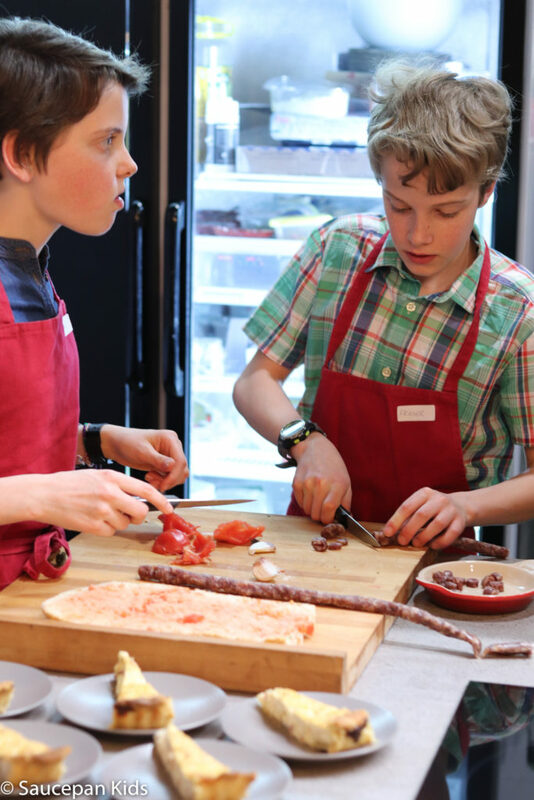 Regular readers of Saucepan Kids know that we love travelling and learning about food, so what better than to combine the two and learn how to make authentic Catalan tapas from the experts. 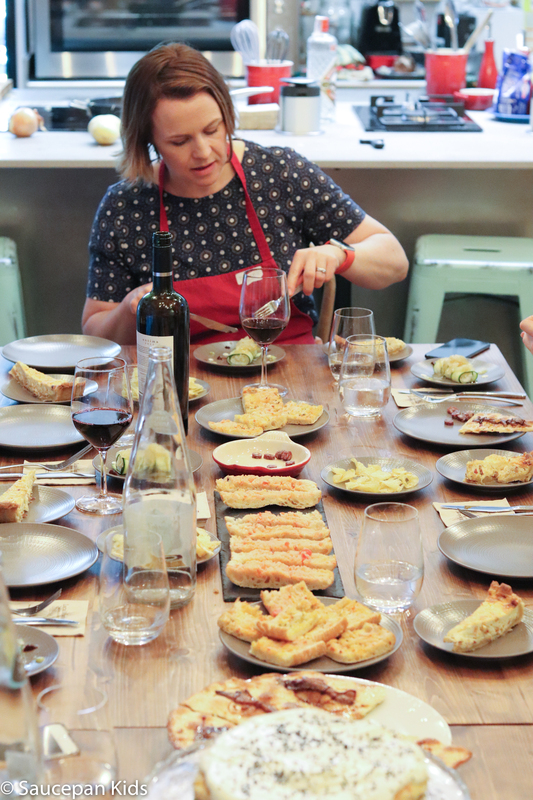 Irene and Mariona, joint owners of The Local Market, run cooking classes in their seriously cool building right in the middle of beautiful Girona. 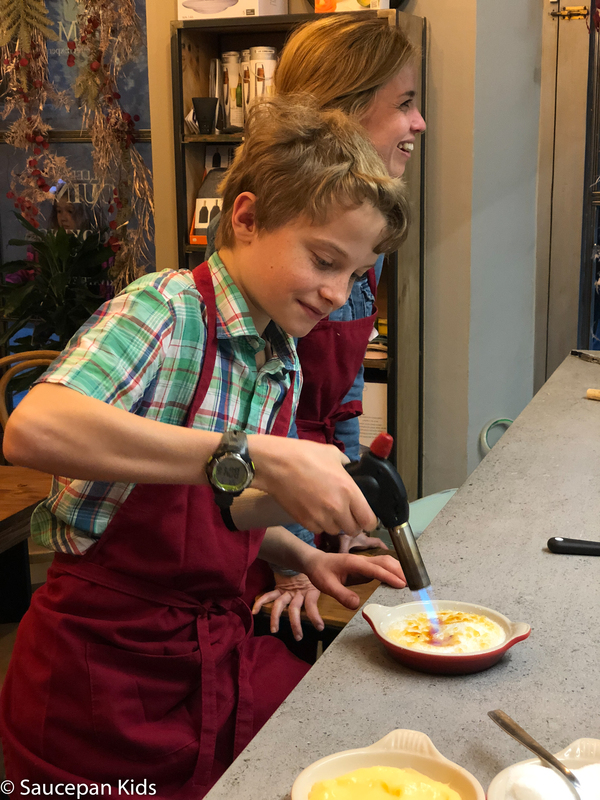 With their help, masterful tuition and excellent English, the children cooked up a storm producing a range of dishes including a three layered tortilla cake, cod cannelloni and creme catalan (which needed a blow-torch much to the kids’ delight). At the end of the evening we all tucked into the fine spread with a nice glass of local wine (water for the kids of course!). 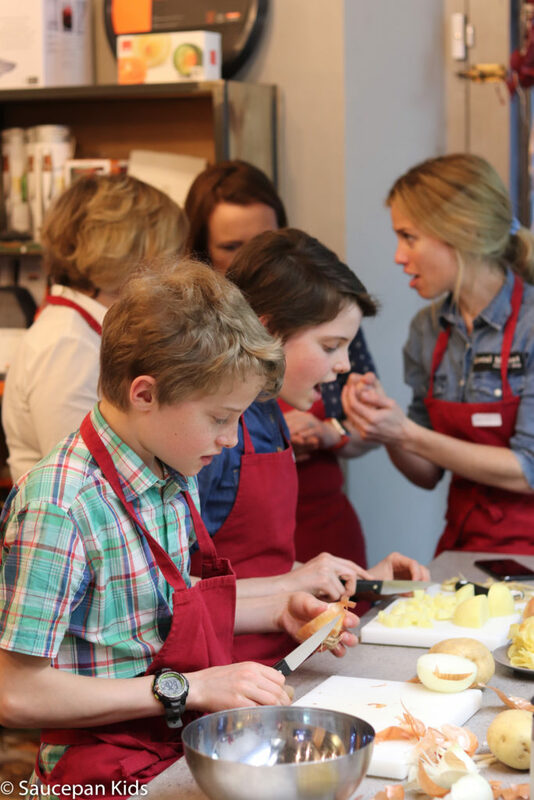 If you enjoy cooking or want to get the kids learning new skills, you should definitely book yourselves into one of their classes when you are in Girona. 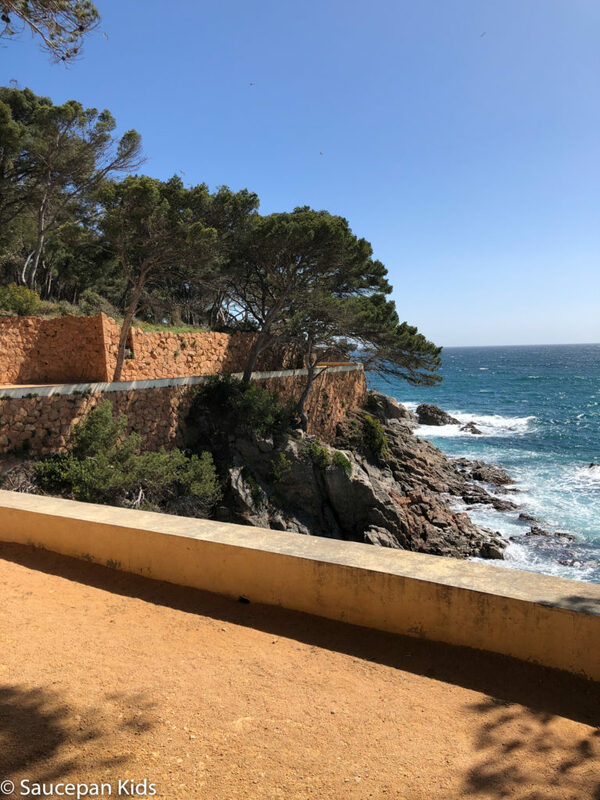 We visited Costa Brava in April and we felt that it was the perfect time of year to enjoy the region. The benevolent climate ensured that we benefited from warm and sunny days without the fierce heat of the summer months. From talking with locals, September and October are also popular times to visit too. 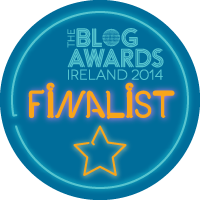 We booked our flights with Ryanair and travelled from Dublin to Barcelona however you can also fly to Girona. 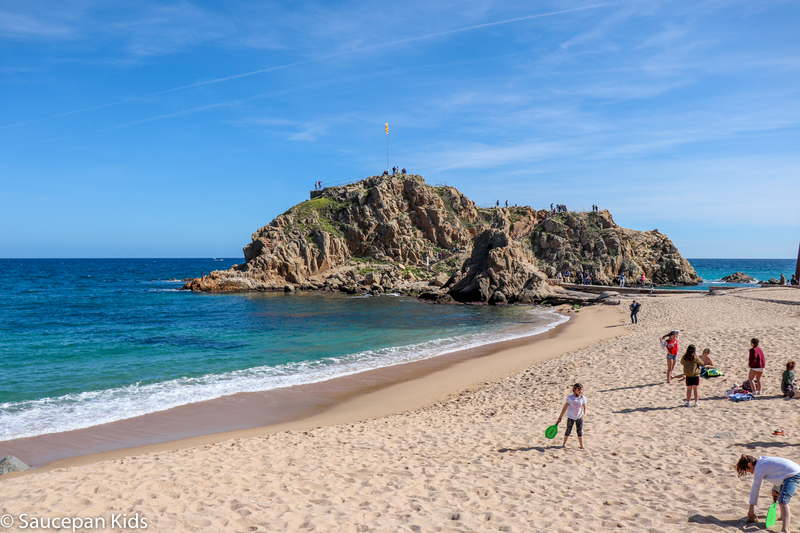 We hired a car with Hertz and drove one hour North to Blanes for the start of our Costa Brava trip. 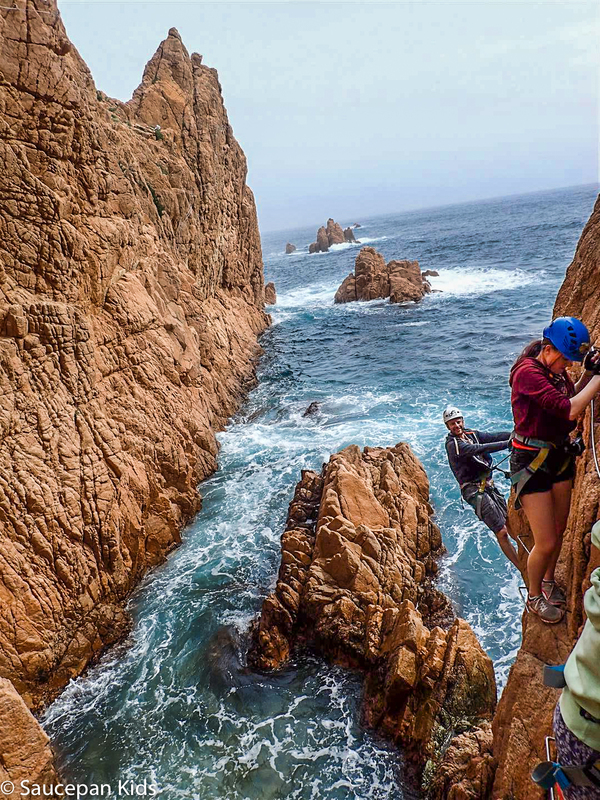 To book your own Costa Brava Girona adventure, head over to Costa Brava Girona Tourism to find out all you need to know to plan your own Catalonia trip. Where did you stay in Costa Brava? 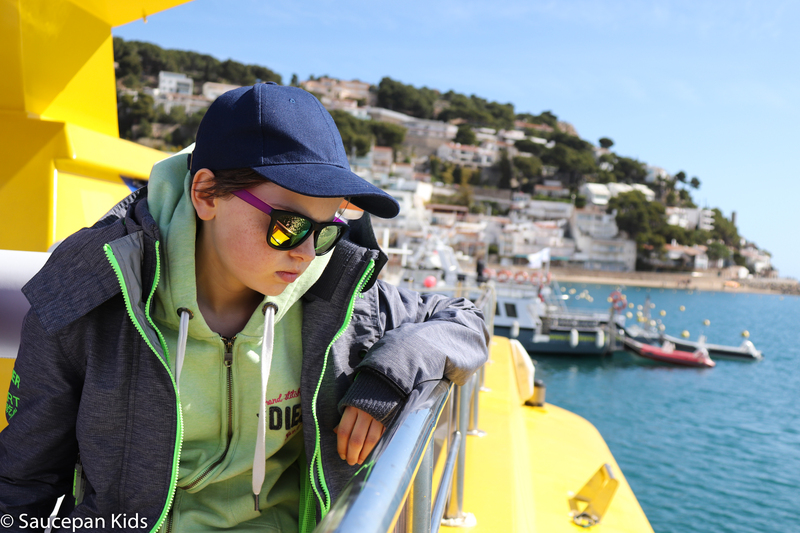 We stayed in various locations during our stay in Costa Brava. Where are you looking at visiting and I’ll see if I can recommend somewhere nearby. I am planning a trip to Barcelona and Costa Brava as well. We are a family of four, kids ages 8 and 13. Once we leave Barcelona and all the city crazy, we want to chill and relax on the beach, and have some downtime for 2-3 days. I’ve been to Cadeques and have friends who love Carcassonne. Any other suggestions of the ideal town to stay in other than the above? 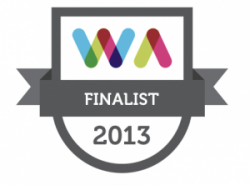 Or, would either of those be your favorites as well? We will then head to France. When are you heading to Costa Brava? 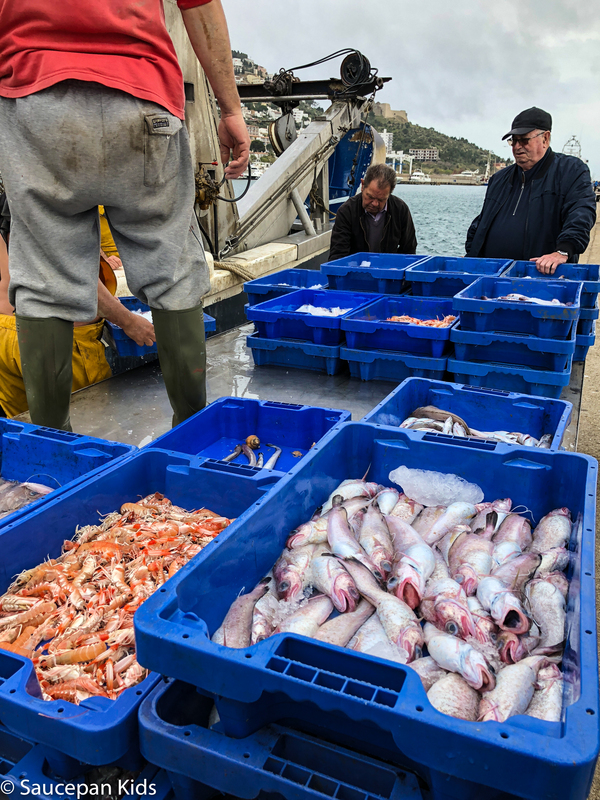 As you’re heading to France afterwards, why not head north along the coast towards Girona. I would recommend considering Lloret de Mar and Tossa de Mar as lovely seaside locations to spend a few quieter days. Platja d’Aro is a gorgeous (but quiet) town and if you’re looking for something more lively, check our Palamos. We’re heading back again ourselves this summer as we loved it so much and we’re going to base ourselves in Roses which is not far from the picturesque village of Cadeques that you mentioned. Wherever you go, definitely head into Girona for a few hours. It’s a beautiful city and much smaller than Barcelona. Any further questions, let me know and have a fab time. Hey Debbie. This is a great post. 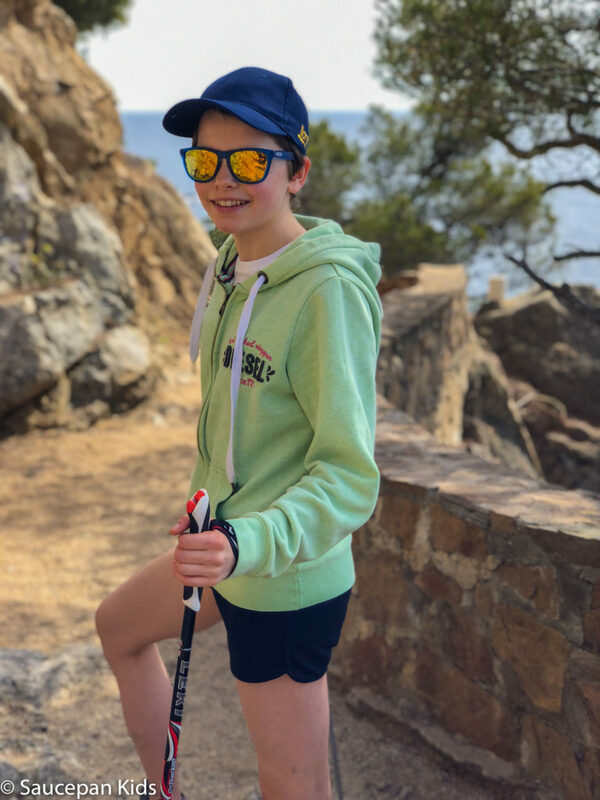 I am planning to travel to Costa Brava with my 2 kids (8 and 11) in early July for 3 days and would love to stay in a farmhouse or other rural lodging with a pool. We would likely spend time in Girona, take a cooking class, go biking, go to the beach. I am trying to figure out which town would be best as a homebase. 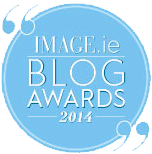 Thank you for your email and your lovely feedback. I’m glad you enjoyed reading our blog post. 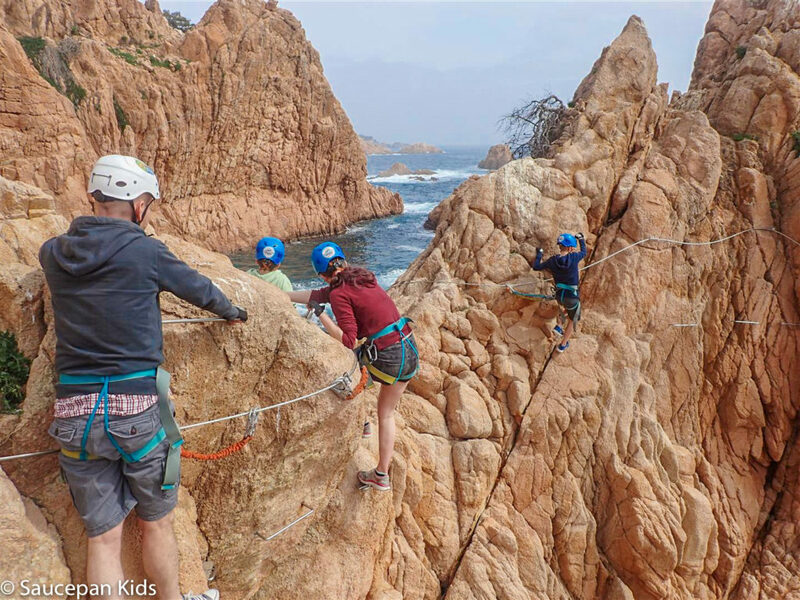 I’m excited to hear that you are looking at taking your two kids to Costa Brava in July. You will all love it. Girona is a truly amazing city and the perfect base for a 3 day stay. 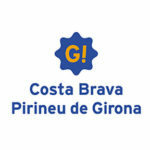 Their website https://www.girona-tourist-guide.com/ will tell you all you need to know about the city. If you are looking for more rural lodging with a pool, would you consider heading to the coast? The towns of Lloret de Mar, Tossa de Mar, Blanes are all wonderful base locations. Alternatively, I would also highly recommend heading north of Girona to the towns of Roses and L’Estartit. If you don’t have a hire car, I would recommend perhaps basing your decision on the easiest train/bus links. 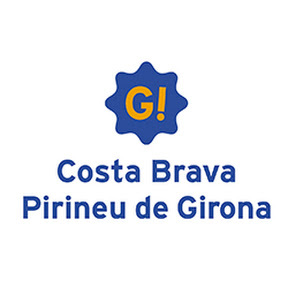 In terms of accommodation, check out the camping association website – https://www.campingsingirona.com/ They have a wealth of knowledge in terms of campsites and lodgings. I hope you have a wonderful time with your family Evan. If you have any other questions, let me know and please let us know how you get on.